Published Monthly in braille and distributed free to the blind by the National Federation of the Blind. President: Kenneth Jernigan, 524 Fourth Street, Des Moines, Iowa, 50309. Inkprint edition produced and distributed by the National Federation of the Blind. EDITOR: Perry Sundquist, 4651 Mead Avenue, Sacramento, California, 95822. Associate Editor: Hazel tenBroek, 2652 Shasta Road, Berkeley, California, 94708. News items should be sent to the Editor. Address changes should be sent to 2652 Shasta Road, Berkeley, California, 94708. "I give, devise, and bequeath unto NATIONAL FEDERATION OF THE BLIND, a District of Columbia non-profit corporation, the sum of $_____ (or, “_____ percent of my net estate", or "the following stocks and bonds:_____ ") to be used for its worthy purposes on behalf of blind persons and to be held and administered by direction of its Executive Committee." The convention will be held in Minneapolis, Minnesota, at the Hotel Leamington during the first part of July. Please note that the schedule is slightly different from that of the past few years. Most of the delegates will probably arrive on Wednesday, July 1, or Thursday, July 2. The Executive Committee meeting (open to all) will occur on Friday morning, at which all states should be represented. In fact, Friday should be regarded as a full-fledged business day of the convention, and the various committee meetings should be attended by all. The first general business session will begin on Saturday morning, July 4. The banquet will occur on Sunday evening, July 5, and the tour will occur on Monday afternoon, July 6. The convention will adjourn at 5:00 P.M. on Tuesday afternoon, July 7. The Hotel Leamington is one of the best we have ever had. Its rooms are spacious; its air-conditioning is flawless; and it can commit as many as 600 sleeping rooms to our convention. We have never had better accommodations. Even so, the rates are extremely attractive. Single rooms will be $7.50, and the doubles and twins will be $11.00. Rollaway for a third person in a room will be $3.00. There will be no charge for children under fourteen occupying a room with parents. The banquet will be held at 7:00 P.M. on Sunday evening, July 5, and the menu will be good. The Leamington is famous for its excellent cuisine. This will be a memorable occasion. We have not definitely decided on the program for the tour, but consideration is being given to visiting the farm of former Vice-President Humphrey, going to Hamm's brewery or the Betty Crocker kitchens, or making some equally exciting excursion. You won't want to miss it. Again in 1970 there will be door prizes galore. Don't be late for the sessions, and don't leave the meeting room. The prizes will be worth winning. Here is a reminder to state and local affiliates: We ask that you please help us by securing as many worthwhile door prizes as possible for the drawings. We again recommend that door prizes be worth twenty-five dollars or more. You will recall that at Columbia many of the door prizes were worth quite a bit more, such as tape recorders, typewriters, and yes, even a five hundred dollar stereo. It is a good idea to get started now. All door prizes should be sent to Mrs. Bertha Bernsdorf, 3549 Kyle Avenue North, Minneapolis, Minnesota 55422. The Twin Cities of Minneapolis and Saint Paul are ideal for a July convention. Minnesota has a worldwide reputation as a summer resort area, and the bracing climate and magnificent scenery fulfill the promise. Minnesota is known as the Land of Lakes—with almost fifteen thousand in the state, six within the city limits of Saint Paul. This is sure to be our greatest convention ever. See you in Minneapolis! Several months ago Evelyn Weckerly began to discuss with me the possibility of reorganizing and strengthening our Michigan affiliate. She pointed out (quite correctly, it seemed to me) that the situation in the state with respect to organizations and programs for the blind was bordering on chaos. In the old days, when the American Association of Workers for the Blind was making some claim that it was a representative organization, it encouraged the formation of state chapters. Such a chapter was formed in Michigan. It was called the Michigan Association of Workers for the Blind. Although not connected with the AAWB, it still exists today and appears to be largely an alumni association of the Michigan School for the Blind. A second organization is the Michigan Federation of the Blind. In the 1940's it was the NFB affiliate in the state. However, when coaffiliation was granted to the Michigan Council of the Blind at the 1957 New Orleans convention, the Michigan Federation withdrew. It had been losing ground for a number of years. Part of the problem with the Michigan Federation can be traced back to its convention (and, particularly, its election) in 1949. At that time a sizeable portion of the membership claimed irregularities and withdrew to form the Michigan Council of the Blind. Subsequently, as Federationists know, the Michigan Council became the NFB affiliate. As the 1950's drew to a close the NFB civil war was fully under way, and the already bad Michigan situation became complicated. With three state organizations of the blind in existence (none of them strong enough to dominate the picture and serve as a central rallying point), further fragmentation and chaos were inevitable. If the National Federation of the Blind had not been so fully occupied with the business of trying to save itself from destruction by its own disruptive minority faction, it might have been able to help bring real stability to Michigan. However, this was not to be, and the deterioration in the Wolverine state was simply one more of the unfortunate side effects of the civil war. As the 1960's progressed—bringing increasing unity, strength, and prosperity to the NFB at the national level and throughout the country—the situation in Michigan did not improve correspondingly. Today, of course, the civil war is far behind us. In fact, it is so far in the past as to seem like nothing more than a bad dream from another era. This is true despite the bad tempered outbursts which appear from time to time in the Braille Forum (the official publication of the American Council of the Blind) and the occasional sniping from leaders of that organization. Such attacks are thoroughly understandable. After all, it is common knowledge that the ACB has virtually no funds and is in the midst of financial crisis. Also, reports reaching me indicate that at some of the business sessions of their "national" convention this summer they had in the neighborhood of twenty people in attendance. Failure and insecurity do not ordinarily make for objectivity, generous action, balanced perspective, or sweet temper. However, back to the situation in Michigan. What was left of the Michigan Federation (our former affiliate) became part of the American Council of the Blind in the 1960's. To further complicate the confused situation a variety of local and regional organizations sprang up, affiliated with nobody and generally working at cross purposes. Many blind people simply withdrew from the whole business and refused to have anything to do with any of the existing entities. In such a climate it is not surprising that strange (one might almost say weird) things have been happening. For instance, it is hard to see how anyone in his right senses and really interested in improving the conditions of the blind could find anything to quarrel with in the NFB's Model White Cane Law. Yet, a number of people could and did in Michigan. One blind lawyer in the state wrote a recent article attacking the Model White Cane Law because it only required drivers "to take all necessary precautions" when approaching a blind pedestrian crossing the street using cane or dog. He said that the Michigan statute was much stronger since it required the driver to come to a full stop and, therefore, that the Model White Cane Law was really a backward step and quite harmful to the interest of the blind. As Federationists know, the Model White Cane Law does three things, the least important of which may well be the item which our blind Michigan lawyer discusses. 1) The Model Law prohibits discrimination against the blind by the state government, by political subdivisions, and by public school districts. It requires that any business financed, in whole or in part, with public funds must give equal employment opportunities to the blind. It establishes an official policy of equal employment for the blind and pledges the state to work affirmatively to achieve this goal. 2) The Model White Cane Law provides that the blind shall have equal access to public accommodations throughout the state—hotels, restaurants, and places of amusement; public streets and sidewalks; all common carriers; and any other place to which the general public is invited. 3) Finally, the Model Law provides that a blind person crossing the street using a white cane or guide dog shall have the right-of-way and that motorists must take reasonable precautions. It also provides that a blind person (otherwise in the right) shall not be deemed guilty of "contributory negligence" by virtue of the fact that he is not carrying a cane or using a dog. The "contributory negligence" feature is very important in insurance and damage suits. If someone likes the provision in the current Michigan law concerning the precautions which motorists must take when approaching blind pedestrians, well and good. If this were the only thing (or even the principal thing) dealt with by the the Law, it would probably never have been developed and it certainly would not be referred to as a "Model Law". All of this background is given to show how bleak the picture in Michigan was when Evelyn Weckerly began to talk with me about making a new beginning in the state. As one more complication, the American Association of Workers for the Blind has recently inaugurated a new policy of building state chapters. Such a chapter has been organized in Michigan, but (as you might guess from the foregoing) a totally new group was formed. The old Michigan Association of Workers for the Blind was simply left to continue as one more part of the overall anarchy. At our Columbia convention this summer Evelyn, Geer Wilcox, Dennis Byrum (the Michigan delegates) and I laid definite plans. It was decided that NFB organizing teams would come to Michigan during the latter part of August and that a complete new beginning would be made. It was felt that it would be better if the Michigan Council of the Blind would vote to dissolve, leaving the way clear for the formation of a new organization which could appeal to all constructive elements. Preliminary inquiries indicated that the members and leaders of the Michigan Council of the Blind would enthusiastically favor such a policy. Friday, August 22, was set for the date to begin the organizing drive, and Saturday, August 30, was set for the date of the charter convention. The largest team we have ever sent into any state was assembled, and the results more than justified the effort and cost. Several of the team assembled in Des Moines on Thursday, August 21: Muzzy Marcelino from California, Chairman of our Jacobus tenBroek Endowment Fund; Ramona Walhof from Boise; Jim Olvig, a recent addition to the staff of the Iowa Commission for the Blind; and Shirley Lansing and Loren Schmitt, both college students. This contingent of the team and I discussed the background of the Michigan situation until far into the night, and they were on their way the following afternoon. When they arrived in Detroit, they were greeted by NFB Board Member Mae Davidow and by a contingent of Michigan leaders consisting of Evelyn Weckerly, Geer Wilcox, and Kerry Enos. This completed the team except for NFB Board Member Ned Graham and his wife Helen, who arrived from Maryland on Monday evening. For the next week the team divided to comb the entire state. Hundreds of blind persons were contacted, and the foundations were laid for a strong and vibrant organization. All activities were focussed on securing new members and on the state convention to be held in Lansing on August 30. By Friday, August 29, the team had assembled in Lansing, and I arrived on the scene with a new contingent. Anna Katherine and I drove from Des Moines and brought with us three students —Marc Maurer, Bob Ramsay, and Mary Medema, who formerly lived in Grand Rapids and whose family still lives there. Excitement was running high, and it was obvious that the convention would be a good one. The meeting was called to order on Saturday morning by Evelyn Weckerly, President of the Michigan Council of the Blind. After roll call, there was a motion to dissolve the Council, and the motion carried unanimously. I then took the chair as National President and convened all present as a committee of the whole. We discussed the work of the Federation throughout the country and plans for the future in Michigan. After lunch we adopted a Constitution and elected officers and Board Members. The day's activities ended with an evening banquet and a Board meeting. Our new affiliate which came into being on August 30 (which calls itself the National Federation of the Blind of Michigan) has the potential for being one of our very best. It begins with a charter membership of one hundred twenty-two, and it also begins with a list of several hundred names of people who have expressed interest and will probably join. The caliber of the organization can be seen in the standing and qualification of its leaders. Evelyn Weckerly, 3830 Beach Road, Troy, Michigan 48084, was elected President. She has a B.A. from Michigan State and has taught six years in public high schools. She will receive her M.A. from the University of Michigan in December. On the undergraduate level she was in the honors program of the college. The First Vice-President is Geer Wilcox of Lansing. He is a social caseworker with the Lansing Family Services Agency, a position which he has held for two years. He was a Peace Corps Volunteer in the Dominican Republic for two years after receiving his B.A. in social relations from Harvard. He has an M.S.W. from the University of Michigan. Geer plans to be married on September 27 to Kerry Enos, who is a secretary for the state of Michigan library. Dennis Byrum of Jackson, Michigan, is the Second Vice-President. He is a freshman at Albion College and was a Michigan Higher Education Authority Merit Scholar in high school. He currently serves as National Secretary for the NFB Student Division. The Secretary of the organization is Allen Harris of Detroit. He has a B.A. in education from Wayne State University and an M.S. in social science from the same institution. He is currently teaching sociology and psychology in the Dearborn public schools and is varsity wrestling coach. He is a man of real capacity and enthusiasm for the work ahead. Dorothy Steers of Ferndale, Michigan, is the Treasurer. She was treasurer of the former Michigan Council of the Blind, a position which she filled most competently. She is active in civic and social life, being a member of the chancel choir of St. Luke's Church in Ferndale and a member of the Royal Canadian Auxiliary. Robert Mounsey of Benton Harbor, an employee of the Whirlpool Corporation, and Irving Wright of Battle Creek, a darkroom technician, were elected for two-year terms on the Board. Irving Wright is the President of the local Battle Creek organization of the blind, and Bob Mounsey has been active in labor union affairs for twenty-five years, having been President of his local for a good part of the time. The two one-year terms on the Board went to John Mullin of Lansing and Dan Webber of Saginaw. John Mullin, one of the most respected blind persons in the Lansing area, is a final assembler at Oldsmobile. Dan Webber is the Chief Assistant Prosecutor for Saginaw County. Prior to this position he worked in the city attorney's office and was law clerk to a federal district judge. He now teaches police officers federal criminal law at Delta Junior College. He has a B.A. from Michigan State University and a law degree from Notre Dame. Evelyn Weckerly was elected delegate and Dan Webber was elected alternate delegate to next year's NFB convention. It would appear that a number of other people from the state will be in attendance. Although the week was taken up with serious business, it had its lighter moments. Consider, for instance, the meeting of the Polish American Veterans which occurred in the same hotel at the same time as our convention. I found myself roused from a sound sleep at 3:30 A.M. on Saturday morning by the plaintive notes of a bugle playing "When the Saints Go Marching In" in swing time. Knowing from long experience the futility of attempting to stop such procedures, I turned over and sought to return to the Land of Nod. However, Loren Schmitt embarked on a different tack. He tells me that he went out into the hall and found one of the Polish Veterans marching up and down in full uniform with bugle blaring. When he remonstrated with the marcher, he was invited to have a drink or go to the lower regions. I gather he declined to do both. There was also the time earlier in the week when one of the team was about to leave a particular hotel to go to another city, and the remaining two members were going to stash their bags in the room of one of them. The member in question brought his own bag to what he thought was the agreed upon room. Unfortunately, he unknowingly inserted his key into the lock of the room next door, and it worked. He went back for the bag of the second member of the team and brought it down. This time he entered the right room—but could not find his bag. He reported the matter to the hotel management, and a thorough search (including house detective) resulted. Later the other members of the team came back to the hotel and entered the room where the first bag had been placed. They immediately reported to the management that their bags had been stolen. Another search and several hours later the mix-up was straightened out to the satisfaction of all concerned, except (perhaps) the hotel management. On Sunday, August 31, I headed home for Des Moines (flying low) with the firm conviction that we now have a solid, substantial Michigan affiliate, one that can and will serve as a rallying point for all of the blind of the state. It was a great week, and it was great fun. Here's to the National Federation of the Blind of Michigan. NOTE: In the following article the extension of the free mailing privilege adopted by the 90th Congress (Part 138, Postal Manual, Title 39, United States Code 4653) is only dealt with as it concerns the use of the mails by blind persons or for their benefit. However, the 90th Congress included in the free mail provisions of the postal rate law persons who cannot use or read conventionally printed matter because of a physical impairment and that which is said about the use of the mail by or for the blind also applies to this other category of disabled persons. Upon consideration of the legislative history of this statute, we have concluded that the statutory reference to "materials or devices...specifically designed or adapted for use of, a blind person..." was not intended to be limited to materials or devices that relate to reading and writing. We have advised the Bureau of Operations accordingly. As I looked at this statement I wondered just what it meant. Could anything which in any way whatsoever had been adapted or devised for a blind person be mailed free? To clarify this I telephoned the Office of the General Counsel of the Post Office Department and explored the matter. While time and future rulings concerning the law may modify its application, as far as I can determine, at the present time, the following is the way it is to be interpreted. "Large print"  cards or any other games with "large print" markings can also be mailed free with the same restrictions. These games marked in such a manner are obviously mailable as "free matter for the blind." Let us consider some other things—Braille writers, slates and styli, the IBM Model D Braille electric typewriter, the large print typewriter (providing they are not too heavy to be mailed), clocks, watches, and other instruments with Braille markings could all go free. How significant must the adaptation of an article be before it may be considered "adapted for the use of, a blind person"? If measuring spoons have been bent so that a blind person may insert them in a wide mouth jar to lift up the liquid to be measured, may they be sent postage free? If a hot plate has had Braille control knobs attached, may it be mailed free? If a cake pan has had grooves cut in the sides so that a blind person may use these grooves as guides to cut neat, even pieces of cake, may it be mailed free? The answer seems to be "yes" providing these items are truly to be used by blind people. (A manufacturer may not try to beat the high cost of postage by producing hot plates with Braille control knobs and shipping them with or without unbrailled knobs (to be attached) to all customers—blind and sighted alike.) In other words, the intent of the law is to make it so that blind people who frequently have to use alternative techniques and alternative devices to do the same things they would do if they were sighted may be relieved of the burden of the postal charges for sending these items (which are usually not readily available to them locally). At no time should the law be a "gimmick" to avoid payment of valid postal fees. (f) Braille writers, typewriters, educational or other materials or devices, or parts thereof, used for writing by, or specifically designed or adapted for the use of, a blind person or a person having a physical impairment as described in Section 138.1a. However, as far as I know, there has been no opinion from the Post Office Department on whether these can indeed be mailed free. I am requesting such a ruling from the Post Office Department and the readers of the Braille Monitor will be informed of what I learn. The language was drafted with the specific intention that it would apply to devices other than devices for reading or producing reading material. For example, a collapsible walking stick for the blind was one of the items mentioned that we thought it would apply to. The free mailing list is extended to—braille writers, typewriters, educational or other materials or devices, or parts thereof, used for writing by, or specifically designed or adapted for use of a blind person or a person having a physical impairment within the meaning ,of this section. * Mrs. Grannis is Assistant Director in Charge of Library and Social Services for the Blind, Iowa Commission for the Blind. 1 "Postage Free Mailing for the Blind" by Florence Grannis, The Braille Monitor, (Berkeley, California), March, 1969, p. 570. 2 Letter from David A. Nelson, General Counsel, Post Office Department, Washington, D.C., to Irvin P. Schloss, Legislative Analyst, American Foundation for the Blind, New York, August 2, 1969. 3 Parcels weighing up to 70 pounds and measuring up to 100 inches in length and girth combined. Public Law 308, 82nd Cong. Chap. 172, 2nd Sess. 4/9/52; Secs. 135.32, 138.325, the Postal Manual. 4 An opinion of the United States Post Office Department defines large print or large type as 14 point or larger. 5 Part 138, Postal Manual; Subsection 4653(b)(5), Title 39, U.S. Code. 6 Letter from John H. Martiny, Counsel, Committee on Post Office and Civil Service, U.S. House of Representatives, to David A. Nelson, General Counsel, Post Office Department, Washington, D.C., June 16, 1969. The blind of Oklahoma are on the way to receiving excellent library service, following the defeat of a brazen attempt at federal interference in state affairs. Library services for the blind and physically handicapped have been moved to the Blind Services Division of the Oklahoma Welfare Commission, thanks to the courageous efforts of Division Chief Travis Harris and Public Welfare Director Lloyd E.Rader, and at the urging of the organized blind of Oklahoma. But no thanks to the Machiavellian machinations of the chief of the Division for the Blind and Physically Handicapped in the Library of Congress, Robert Bray. The move had long been sorely needed. For many years the blind of Oklahoma and Arkansas had received notoriously poor service from the Regional Library when it was part of the Oklahoma State Library. Along with many other library services for the blind, it was plagued by a lack of space, finances, specialized know-how and coordination with other services for the blind. Conservatively, a good library service for the blind requires average expenditures of fifty dollars per year for each person served. But while more than 3600 blind residents of Oklahoma and Arkansas used this library, it operated on a budget of approximately fifty thousand dollars a year—an average per capita expenditure of less than fifteen dollars. The improvements needed in the Regional Library required a totally new approach and increased financing of the State Library, or a move to another agency. Since Oklahoma's welfare operations are well financed and contain rehabilitation and all other services for the blind, the move was logical. The state lawmakers passed the necessary legislation in April of this year—over the determined opposition of State Library Director Ralph Funk. And then the pot began to boil. Ralph Funk, Director of the Oklahoma Department of Libraries, said Wednesday all library services to the blind will come to a halt July 1 because of the transfer of the services to the Public Welfare Department. Funk released an opinion by Charles R. Wheeler, regional attorney for the Department of Health, Education and Welfare, which said the twenty-five thousand dollar grant must be administered by the state library administrative agency. He said this means the official state agency charged by state law with the extension of public library services throughout the state. Funk said he was told by the Library of Congress in a telephone conversation that the state library is the regional library for the books. "I was told not to turn over the books to the Welfare Department," he said. "The books are not to be removed from the filing shelves." The statement was immediately challenged by Lloyd Rader, public welfare director, who said eleven other states having programs not under state library departments are qualifying for federal funds. Rader said the state has the right to designate the agency to administer the program. "Oklahoma is entitled to the twenty-five thousand dollars," Rader said. "I have no fear but what the state will get it." Rader accused Funk of carrying on "quite a campaign against the transfer." He added, "We're going to carry out the statute and administer the program. I'm surprised that an employee of any other state agency would endeavor to thwart the will of the legislature or governor." You can't make me believe forty nine states are going to get the money and Oklahoma is going to be denied. We feel that Ralph Funk was within his rights to try to keep the legislature from making this transfer, but once the legislature spoke it was up to him to leave it alone. I know that he has been doing everything he can to block it, and the people of Oklahoma are going to hold him responsible. Earlier, the director of the Tulsa City-County Library System, which maintained a regional branch service to the blind and physically handicapped under the Oklahoma Department of Libraries, had written a not-unexpected letter to Library of Congress Director L. Quincy Mumford, urging that the library materials not be moved from the State Library and the Tulsa Library, pending a careful study. Mr. Bray has no doubt brought you up-to-date on recent legislation in Oklahoma transferring library service to the blind and physically handicapped from the Oklahoma Department of Libraries to the State Welfare Department. If this transfer is consummated the service will be seriously jeopardized and the blind and physically handicapped patrons deprived of the full range of library services now being provided. Blind and physically handicapped patrons in the Tulsa area have expressed themselves as being strenuously opposed to the move. In the first place, every organized group of the blind in our state, so far as we know, favors this transfer. The leaders of all these organizations have publicly endorsed this transfer and were represented at the legislative hearing. To our knowledge, every service to blind people in our state that has been transferred to the Department of Public Welfare has been improved because of the transfer. We see no reason why the same treatment will not occur here, and we are firmly convinced that the Library for the Blind and Physically Handicapped will see improvement under the transfer. Your material clarified the situation a great deal, especially since I have received earlier in the month a copy of the letter from Mrs. Martin to Mr. Mumford, Library of Congress. If I may be of any assistance in this matter, please feel free to contact me. There is a great opportunity in Oklahoma to better coordinate by consolidating all services to the blind people. As far as we knew, all blind groups in the state wanted this transfer because they wanted better service. will alter its state plan with respect to the services for the blind or physically handicapped to reflect the Oklahoma Public Welfare Commission's participation, and the applicable federal funds will be disbursed by the Department of Libraries to the (Welfare) Commission as other funds are disbursed to other participating libraries or agencies. But Funk and their cohorts were readying their heavy artillery, and their biggest gun was no less a personage than Robert Bray! Funk attended the American Library Association's convention in Atlantic City, where Bray was one of the main participants. The chief of the Library of Congress' Division for the Blind and Physically Handicapped propagandized against the transfer to the point where the ALA's Round Table on Library Services to the Blind and Physically Handicapped (an informal subdivision of the ALA) was induced to pass a resolution that libraries for the blind should be in "library settings' . Interestingly, a tape recording of the Round Table proceedings was subsequently obtained—but someone had carefully edited out every reference to the Oklahoma controversy!!! I HAVE YOUR TELETYPE MESSAGE OF JUNE 17 IN WHICH YOU REQUEST INSTRUCTIONS ON THE DISPOSITION OF THE LIBRARY OF CONGRESS' COLLECTION OF BOOKS FOR THE BLIND AND PHYSICALLY HANDICAPPED IN YOUR CUSTODY. (1) KEEP THE COLLECTION IN ITS PRESENT LOCATION AND UNDER YOUR JURISDICTION. LOCK THE DOORS AND DISCONTINUE SERVICE AS OF JULY 1, 1969, IF BY THEN YOU ARE STILL FORCED TO DO SO BY CONDITIONS IN OKLAHOMA. (2) NOTIFY ALL OF YOUR READERS AT ONCE BY FORM LETTER OF THE ACTION YOU HAVE BEEN FORCED TO TAKE AND EXPLAIN THAT SUCH ACTION WAS INDEED OCCASIONED BY OFFICIAL AND PRIVATE AGENCIES WHO PURPORT TO HAVE THE INTERESTS OF THE BLIND AND HANDICAPPED RESIDENTS OF OKLAHOMA AT HEART. LIST THEM IN THE FORM LETTER AND SEND A COPY TO ME. INCLUDE ALL CONCERNED PARTIES AND ORGANIZATIONS IN THIS NOTICE; E.G. THE MULTIPLE SCLEROSIS CHAPTERS, CEREBRAL PALSY AFFILIATES, TEACHERS OF THE HANDICAPPED, PRINCIPAL PUBLIC LIBRARIES, VETERANS HOSPITAL AND NURSING HOME ADMINISTRATORS, ETC. (3) I RECOMMEND FURTHER THAT YOU APPRISE THE GOVERNOR PERSONALLY OF THE STATE OF AFFAIRS AND OF YOUR CONCERN FOR THE READERS YOU HAVE BEEN SERVING. I HAVE PERSONAL KNOWLEDGE OF THE INTEREST OF YOUR MEMBERS OF CONGRESS AND THE SENATE IN THIS LIBRARY SERVICE. I CAN ONLY CONCLUDE AT THIS WRITING THAT YOUR GOVERNOR HAS BEEN GIVEN INCOMPLETE OR INACCURATE INFORMATION. HE CAN TAKE THE ACTION NECESSARY TO RESOLVE THIS PROBLEM. I AM SENDING HIM A COPY OF THIS LETTER AS A MATTER OF BOTH COURTESY AND PROFESSIONAL OBLIGATION AS I AM CERTAIN THAT HIS CONCERN FOR ALL OF THE HANDICAPPED READERS IN OKLAHOMA EXCEEDS THAT OF ANYONE ELSE. FOR THE RECORD, I AM COMPELLED TO REPORT THAT I HAVE HAD NO DIRECT COMMUNICATION, ORAL OR WRITTEN, FROM MR. TRAVIS HARRIS WHO PRECIPITATED THIS CRISIS AND DISRUPTION OF SERVICE, FROM MR. L.E. RADER UNDER WHOSE AEGIS MR. HARRIS OPERATES, FROM MR. DURWARD MCDANIEL WHO IS THE PRINCIPAL APPARENT LOBBYING INTEREST IN THIS MATTER, OR FROM MR. REESE ROBRAHAN, PRESIDENT OF THE AMERICAN COUNCIL OF THE BLIND WHICH MR. MCDANIEL REPRESENTS. THEREFORE, I HAVE BEEN PLACED IN A POSITION COMPARABLE TO YOURS IN WHICH I CAN ONLY SURMISE AS TO THE MOTIVATIONS OF THESE INDIVIDUALS IN ACTING AS THEY HAVE. IN SUMMARY, THE OKLAHOMA DEPARTMENT OF LIBRARIES IS STILL THE AGENCY DESIGNATED BY THE LIBRARY OF CONGRESS TO COOPERATE WITH THE LIBRARY OF CONGRESS IN PROVIDING LIBRARY SERVICE TO ELIGIBLE BLIND AND PHYSICALLY HANDICAPPED PERSONS. I HAVE NO INFORMATION WHATSOEVER ON WHICH TO EVEN CONSIDER THE STATE DEPARTMENT OF PUBLIC WELFARE AS COMPETENT TO RENDER THIS SERVICE. THERE ARE 42 COOPERATING REGIONAL LIBRARIES IN THE NATION WORKING WITH US OF WHICH YOURS IS ONE OF THE LONGEST ESTABLISHED. LESS THAN HALF A DOZEN OF THESE LIBRARIES ARE OPERATED BY NON-LIBRARY AGENCIES AND THESE ARE DUE TO HISTORICAL ACCIDENT OR THE DEFAULT OF A PARTICULAR STATE LIBRARY AGENCY. THE OKLAHOMA DEPARTMENT OF LIBRARIES HAS, TO MY KNOWLEDGE, NEVER DEFAULTED OR COMPROMISED ITS OBLIGATIONS TO THE HANDICAPPED READERS IN ITS STATE. clarified Saturday what he called a "misunderstanding" over reports concerning the status of library service to the blind. He said the services are to be discontinued July 1st, but not because the legislature ordered them transferred to the state welfare department, as was reported earlier. Funk said the services are to be halted because of a directive from the Library of Congress, which owns the "talking books" that are circulated to the blind Funk said the directive said in part: "Keep the collection in its present location and under your jurisdiction. Lock the doors and discontinue service as of July 1st." "I'm fully aware that the legislature can transfer services from one agency to another," Funk said. "But I must protect the department and its entire program and cannot take any action contrary to federal law." Funk said he hopes an arrangement can be worked out whereby at least part of the library services to the blind can be resumed. Scare tactics, and a not too thinly veiled threat. But Bray's letter to Funk was the high point—or more correctly—the low point in his and Funk's campaign to thwart the legislature, Governor, state officials and blind people of Oklahoma. It sparked a series of telegrams of protest from organizations of the blind to the Oklahoma congressional delegation, asking for aid in the dispute. In addition, Welfare Director Rader travelled to Washington to speak with the congressional delegation and Library of Congress officials. A dispute between the Oklahoma State Library and State Welfare Department over administration of library services to the blind apparently will be settled in Washington Monday. Paul Berry, director of the reference department of the Library of Congress, said Friday that a meeting will be held with L. Quincy Mumford, Librarian of Congress, and Lloyd Rader, State Welfare Director. Although he could not guarantee what decision Mumford will make, Berry said he thought that Rader would probably win his case against Ralph Funk, Director of the Oklahoma Department of Libraries. Berry said Mumford will settle the dispute at the meeting Monday. "I don't forsee any problem to the transfer," Berry said. "The whole thing was an unfortunate lack of understanding." It was a subordinate of Berry, Robert Bray, chief of the Division for the Bund and Physically Handicapped, who earlier sided with Funk in his efforts to obtain control of the library materials. And as one might expect, "Bray was out of Washington Friday," and could not be reached for comment—not surprising, of course, under the circumstances. Now, what of "I'm fully aware that the legislature can transfer services from one agency to another, but I must protect the department and its entire program and cannot take any action contrary to federal law."? The Librarian of Congress, L. Quincy Mumford, at a meeting today in Washington with L. E. Rader, Director of Public Welfare, State of Oklahoma, announced the designation of the Public Welfare Commission as the agency in Oklahoma to serve as regional center for library service for the blind and physically handicapped. This designation is in accordance with action taken at its 1969 session by the Oklahoma legislature, which provided that special library services for blind and physically handicapped persons would be provided by the Section of Services to the Blind of the Oklahoma Public Welfare Commission. Mr. Rader announced that the new facility, which will have improved resources, space, and staff, will be known as the "Oklahoma Library for the Blind and Physically Handicapped". It will meet the same standards of library service formerly provided by the State Department of Libraries, the State agency originally charged with these functions, and will work closely with the Library of Congress' Division for the Blind and Physically Handicapped in rendering services according to established standards. The transfer to the Public Welfare Commission becomes effective July 1, 1969. The Division for the Blind and Physically Handicapped of the Library of Congress makes available through regional centers recordings, tapes, and braille, large type, and talking books. Although his name was not mentioned in the release, it can safely be assumed that Bray was reprimanded by Mumford—not only for irresponsibly involving himself in a state's affairs, but also because no government administrator appreciates having his agency discredited by the indiscretions of an underling. As for Funk, an Oklahoma state official recently described him as being "really on the griddle". Meanwhile, a legal indiscretion was discovered in Oklahoma before the State Welfare Department took over from the Department of Libraries the facilities housing the talking book section on July first. The Daily Oklahoman of June twenty-fifth quoted the State Affairs Board Chairman Scott Tuxhorn as saying the space where the State Library has been operating "was leased illegally". "No agency can lease," Tuxhorn said. "It has to go through the Board of Affairs." Tuxhorn added that a check of records shows that the State Library made no report to his department when it leased the property for operation of blind library facilities and to store documents. Under the section of Services to the Blind there will be more state funds available for this special library service than under the Department of Libraries. We know, and we want your readers to know, that the state will not lose any federal funds because of the change in administration. Also, we want your readers to know that the books belonging to the Library of Congress will be transferred to the new library and that service will continue from the same location. Unfortunately, the last statement turned out to be only half true. When Bray was defeated in his attempts to subvert the sovereignty of a state and thwart the will of its laws and people, he did not retire from the field with a measure of grace. Unbelievable though it may sound, he "went underground" and almost immediately proceeded to indulge in further mischievous meddling and subversion. After the Oklahoma library was transferred to the Welfare Department, a library service for the Arkansas blind was established within the Arkansas Library Commission. The logical course would have been for the Oklahoma library for the blind, now under the Welfare Department, to continue to serve Arkansas while the new Arkansas library was being stocked from the Library of Congress and other sources. At least, one would suppose that consultation and orderly transition would have been attempted by federal officials. Witness the news release (already quoted) from Mr. Mumford's office. But no! Such was not to be the case. Without the knowledge or consent of Travis Harris or other officials of the Oklahoma Welfare Department, instructions were sent under the aegis of Robert Bray to blind and physically handicapped borrowers in Arkansas that they were to return to Oklahoma none of the books which they had at the time of the transfer. Instead, all such books were to be sent to the Arkansas Library Commission. Meanwhile, Oklahoma welfare officials (unaware of this move) were trying to make an orderly transfer of authority and continue the service to the blind of their state. The effect of all this is obvious. The Oklahoma library was small to begin with, because of a lack of space. In fact, this resulted in periodic consignments of its already meager stock of books to the ash heap. Since one-quarter to one-third of the books are usually in circulation, and since many borrowers will often have as many as a dozen books at any one time, it can easily be imagined how severely the size of the library was further reduced. In addition, most of the books lost to the Oklahoma blind were the more popular ones, since these are most frequently in demand. And the Library of Congress' instruction injected another element of chaos. A library for the blind often sends out only portions of books, and dispatches the remainder when the first portions are returned. Thus, in many cases, Arkansans probably returned part of a book to the new library in Arkansas, while the rest of it remained (and still remains) useless on the shelves of the Oklahoma library. In other words, the philosophy would seem to be: "If you cannot lick them . . . if you cannot have your own way, then scorch the earth and destroy; pull down the walls and leave the service in chaos." What ethics! What dedication to the principles of service! What librarianship! It is not surprising that Travis Harris reports many of the titles in the Oklahoma library are missing. Chalk up another one for Bray. Harris says that he is determined to give excellent library service to the blind and physically handicapped in Oklahoma, and has already translated his determination into action. But he faces obstacles in addition to those already mentioned. As an indication of the condition in which the library was found, many of the braille volumes had never been dusted, or very rarely. Of a far more serious nature, all of the correspondence from the Library of Congress—including communiques concerning new legislation, agency lists, etc.—were destroyed at the time of the transfer. One can reasonably assume that this unreasonable act was done out of pure malice. Nevertheless, the Oklahoma library is now where it belongs, and the blind can look forward to the fulfillment of Welfare Director Rader's prediction that it will be the best library for the blind in the world. The Oklahoma story has a double significance. The most obvious is the conduct of Robert Bray. His persuasion of the American Library Association's Round Table on Services to the Blind and Physically Handicapped to pass a resolution not in the best interests of the blind and physically handicapped of Oklahoma was unethical, to say the least. His obnoxious attempts to interfere in a state's affairs by suggesting the closure of a library service, thus cutting off all access to reading by an entire segment of the population, was completely and totally irresponsible. His compounding the felony by effectively stripping the Oklahoma library of many of its books comes close to the ridiculous. The mere fact of Bray's interference comes as no surprise. He has done so before, but in a somewhat more judicious manner. The second significant facet to the Oklahoma story is more subtle, but perhaps of even greater overall importance. It is the question of whether library services for the blind belong in "library settings" or in agencies for the blind. The question will probably continue to be debated long after Bray has left the scene. Of the forty-three regional libraries now associated with the Library of Congress, only four—Florida, Iowa, Minnesota, and Virginia—are located entirely in agencies for the blind. In two other states—California and Massachusetts—the library service is divided, part of it administered by an agency for the blind, and part by a regular library. Most of the remainder of the libraries for the blind are in state library settings, with a few still in large city libraries. The American Library Association favors the placement of library services to the blind in "regular library settings". They claim these settings provide such resources as bibliographic tools and a multitude of reference books. They further claim a library service away from a library setting does not provide the "stimulation" resulting from access to a large number of print books. And the ALA maintains a library setting is necessary to keep up high standards of service. Valid arguments, perhaps, from the standpoint of the library profession. But what of the standpoint of the blind who are to receive the services? Is it not more stimulating for the blind to make frequent visits to their library and receive answers to their questions in person, rather than by mail? With a proper staff and facilities, a library in an agency for the blind can supply the total book needs of the blind, while state libraries generally don't know what the exact needs are, except those needs directly related to library borrowing. With state libraries usually operating on limited budgets and limited space, and with most of their personnel short on knowledge about services for the blind, it's the blind themselves who usually end up getting shorted. Library services are an integral part of the total range of rehabilitation and social services, fitting in with an agency far more than in a general state library service. The newly blinded undergoing rehabilitation in an agency, or the college student being helped by that agency, should have frequent and personal access to the library service. Of course, all is not totally black or white; the mere location of a library for the blind in an agency for the blind setting does not insure good library service. Admittedly, there are libraries for the blind located in agencies for the blind which give less than ideal service. On the other hand, some of the libraries in agencies for the blind are second to none in their performance. There are still other libraries in agencies that fall somewhere in between, just as there are good, bad, and indifferent library services in actual "library settings". All other things being equal, there would seem to be a potential for better library services when they are located in a specialized agency for the blind. This is already beginning to be proved in Oklahoma. This brings into focus the significance of Bray's attempt to interfere with local affairs; it fits a much broader picture of an attempt to freeze library services for the blind into a state library mold. Probably the most powerful single force in the ALA is the organization of state librarians. Under the circumstances, it is perhaps not surprising that they wish to expand their "empire", or that Bray would like to curry favor with them. The picture is further brought into focus by the part which state librarians and Bray have played in the direction and emphasis of COMSTAC and its successor agency, the National Accreditation Council for Agencies Serving the Blind and Visually Handicapped, Inc. Then, too, there is the craze currently sweeping the country, to reorganize all state governments along the lines of so-called "integration" of services and neatness of organizational chart. The unique nature of services to the blind, the advantage of coordinating these services under a single entity, and the reinforcement which each can gain from the other can be forgotten and submerged in the special brand of politics which goes by the name of "social planning". The Oklahoma story shows that vigilance by the organized blind and officials of agencies doing work with the blind can thwart "Bray-zen" actions of the type attempted in the Sooner State. It also shows that vigorous effort can bring about improved library service in a setting where it belongs. The Fourteenth Annual Convention of the Empire State Association of the Blind was held August 30-31 and September 1 in Rochester, New York, at the Sheraton Hotel—and it was a very "loaded for business" convention. John Nagle, the NFB Washington Office Chief, gave the keynote address: "To Build a New Life, Blind." Other program speakers were: Miss Elizabeth Smith of the New York Commission for the Blind—"The Blind and Vocational Rehabilitation"; Mr. John Gentry of the New York Civil Service Commission—"The Handicapped and New York State Civil Service"; Sam Wolff of CHOOSE—"The Blind and Employment"; Anthony Pelone of the Division for the Education of Handicapped Children, New York Department of Education; and Anthony Cimino of the New York State School for the Blind, Batavia, both of whom discussed various aspects of the education of blind children in public and residential school programs; Mrs. Ann Lempert of the Rochester Business Institute—"The Blind as Computer Programmers"; and a tape recording from the Hadley Correspondence School which explained the sonic guidance device was played. Much organizational business was transacted. In addition to the usual reports by officers, reports were given on the 1969 NFB convention, on Federal and State legislation, vending stands, public relations, the White Cane Mailing campaign and Vocational Rehabilitation Services study and evaluation. The State constitution was amended and five organizational policy-making resolutions were adopted. Elections were held and the following were elected to a two-year term of office: William Dwyer, President; Dominic DeJohn, First Vice-President; Wilbur Webb, Second Vice-President; Laura Herman, Secretary; and Dorothea Vogel, Treasurer. 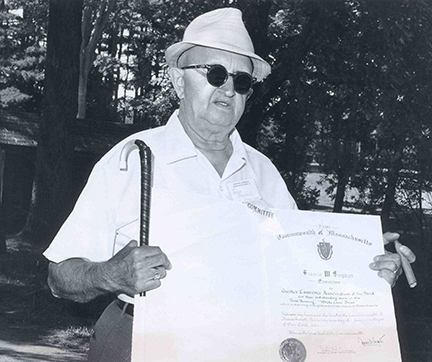 William Dwyer was chosen delegate to represent the organized blind of New York at the 1970 Minneapolis Convention of the National Federation of the Blind, and Sam Lentine was named alternate delegate. Nearly one hundred Empire State Federationists and their families and friends attended the convention banquet which was high-lighted by an address given by John Nagle. Niagara Falls was confirmed as the cite of the 1970 ESAB convention to be held October 10-12, 1970. The '71 location will be determined by the Board of Directors of the Empire State Association of the Blind. Following the passage of the "minimum need" bill which increased Aid to the Blind grants to a minimum of $140 per month for a single individual, we received information that the Welfare Department had altered their rules in a manner which reduced grants to a substantial number of blind persons. The Welfare Department had, in fact, decreased the grants of one hundred twenty blind persons by $40 per month because of a rule alteration which indicated that the dependents of A.B. recipients were ineligible for Aid to the Blind money or Title XIX benefits. In addition to the above mentioned cutbacks, the Department of Welfare decided that the children of an Aid to the Blind recipient were no longer eligible for A.D.C. grants and that the amount of exempt earnings from any source for an A.B. recipient would be reduced to $5 per person although $7.50 had previously been allowed in many cases. Thus, a needy blind person with a spouse and dependent children received an A.B. grant of $140 per month—and nothing else—by the new rules; on the other hand, the same person had formerly received a grant of $180 per month plus Title XIX benefits and A.D.C. money for dependent members of the family. Consequently, a meeting was arranged with Mr. James Rowan, Assistant Director of the Department of Social Services, and a committee composed of Mr. John N. Taylor, Mr. Neil Butler, Mr. Phil Parks, Mr. Don Morris, and myself attempted to persuade him that little had been gained if the Department insisted on robbing Peter to pay Paul. That is to say that the Legislature did not intend to decrease grants to needy blind persons with dependents when they passed the "minimum need" bill which substantially increased grants to blind individuals. Mr. Rowan indicated that he understood the problem; however, he insisted that the Department did not have the funds available to put the former rules back into effect. It would seem that the $30,000-$40,000 of unused Aid to the Blind funds which the Department had returned to the general fund was not retrievable. Mr. Rowan said, in effect, that the Department of Social Services had to enforce the law which provided individual blind persons with a minimum grant of $140 per month; however, it was necessary to remove people who are not blind to accomplish this. After some hesitation, Mr. Rowan agreed to reinstate the former rules if we obtained the extra $30,000-$40,000 from the Governor. On August 4, 1969, the same committee which had argued with Mr Rowan plus Mr. Kenneth Jernigan, NFB President, contacted Honorable Robert D. Ray, Governor of the State of Iowa, to request the necessary funds. Governor Ray was sympathetic to our case and contacted Mr. Marvin Seldon, the State Comptroller. The Governor and Mr. Seldon agreed to straighten the situation out and obtain additional funds if possible. On the following Friday, the committee members received word that the old rules which allowed benefits to the dependent family members of an Aid to the Blind recipient would be reinstated as of October 1, 1969. Moreover, all county Departments of Welfare were advised to make applications effective as of August 1, 1969, on a retroactive basis so that Title XIX benefits would not be interrupted. Subsequently, it was learned that the directive to the County Welfare Department had not been issued in time to meet the October 1, 1969 deadline and that the cuts in grants to the dependents of A.B. recipients will be restored November 1, 1969. However, a supplementary check will be issued to make the restoration of lost benefits retroactive to August 1, 1969. Although a few blind persons suffered temporary setbacks and the reinstated Welfare rules are temporary pending legislative action to authorize permanent funds, the final word through all of this "hanky-panky" is total victory. Once again, the blind of Iowa have united to protect a benefit which they had previously established with a unified effort. The South Carolina Aurora Club of the Blind, Inc., held its thirteenth annual convention at the Aurora Center of the Blind on September 13. Some one hundred persons were in attendance for the one day meeting. The morning session featured a panel discussion entitled "Developing Leadership". This panel was chaired by NFB First Vice-President, Donald C. Capps. Others on the panel were Mr. Luther Kelly, Assistant Postmaster of Columbia, Mrs. Mildred Kirkland of the Charleston Chapter, and Robert Oglesby, Secretary of the Aurora State Organization. Mr. N. F. Walker, Superintendent of the South Carolina School for the blind, spoke during the luncheon bringing the group up to date on the progress of the school. The afternoon session dealt largely with committee reports and resolutions. The principal resolution adopted by the group calls for increased public assistance to blind aid recipients of the state. Three former employees of the broom shop, Vertis Rheuark, Padgett McKenzie, and Hosea Beaver, told the group of their new jobs secured for them by the South Carolina Commission for the Blind. Mr. Rheuark now operates the vending stand in the Federal Building in Columbia, earning an excellent livelihood whereas he formerly earned only thirty-two dollars a week with the broom shop. Mr. McKenzie is now employed by the Mental Health Commission as a medical records transcriber. Mr. Beaver is employed by a large industrial firm as an assemblyman. The evening banquet featured several presentations and an address by Dr. Fred L. Crawford, Executive Director of the South Carolina Commission for the Blind. The Aurora Service Award, given annually to the sighted person judged by the organization to have made the greatest contribution to the well being of the blind, was presented by Donald C. Capps to Mr. Allen Mustard, a public utility official. Mr. Mustard is Chairman of the Advisory Board of the Aurora Center of the Blind, and was highly instrumental in the erection of the Aurora Center, as well as the passage of the Commission Bill. Dr. Samuel M. Lawton, Founder of the Aurora Club and Chairman of the South Carolina Commission for the Blind, received the Donald C. Capps Award, which is given annually to the blind person who is considered to have made the greatest contribution to his fellow blind. Ways and Means for the Blind, Augusta, Georgia, created the Donald C. Capps Award in 1961. The Jack Morrison Memorial Award was given to Miss Gayle Martin of the Spartanburg Chapter. In his address, Dr. Crawford spoke on the rehabilitation of the blind and stressed the services an agency for the blind should render blind persons. Dr. Crawford emphasized that an agency for the blind should concentrate on finding good jobs for blind people rather than wasting money in other areas such as being a statistical bureau. Newly elected board members are W. J. Young, McDonald Hancock, James Coleman, Mrs. Irene Hudson and Mrs. Catherine Morrison all of Columbia; B. D. Gallman, Sammie Smith, Grayson Gallman, and Francis Wilkins of Spartanburg; and Mrs. Mildred Kirkland, Mrs. Elizabeth Porter, and Mrs. Juanita Jones of Charleston. Alexander J. Chavich, thirty-eight, a music expert who says he doesn't expect any particular problems because of his lack of sight, has been assigned to a junior high school in the Bronx, New York City, where he will teach a general music course. He is the first blind teacher to be hired by New York City. He was turned down when he first applied; then he filed an unsuccessful suit against the Board of Education. Now here is the story behind the story. Mr. Chavich based his suit on the Empire State Association of the Blind's first amendment to the Education Code which did not tie in the City of New York relative to the hiring of blind teachers. All of the agencies in New York, and the then President of the National Federation of the Blind, Jacobus tenBroek, were extremely interested in the case. After Chavich lost his case, Dr. tenBroek wrote William S. Dwyer of the ESAB, asking if he would introduce a new amendment in the Legislature as Legislative Chairman. Bill Dwyer got the bill written and sent it to Dr. tenBroek for his approval. Bill then got Senator Clinton Dominick, then Chairman of the Education Committee, to introduce the bill. After the usual blood, sweat and tears, it was signed into law. This is why Mr. Chavich is now hired to teach in New York City. There are eight more blind persons who have been licensed to teach in the City. This is a real "breakthrough" for blind teachers in New York City and is another victory for the ESAB and the NFB. All things considered, in a session of the California State Legislature where the California Council of the Blind expected at best to tread water and achieve its one major objective of a Commission for the Blind, we did very well. We lost our Commission bill but were able to protect Aid to the Blind and to secure enactment of several innovative ideas. In addition and equally important, our efforts helped to kill legislation which would have proved detrimental to blind welfare recipients, workers at California Industries for the Blind, cafetieria and vending stand operators, and blind students. Legislation which was passed by the 1969 Regular Session of the Legislature would do the following: increase from six dollars to eight dollars a month the State's contribution toward health insurance premiums paid by workers in California Industries for the Blind; create an Appeals Board of five members, a majority of whom must be disabled; require that four percent of the wages paid to blind or otherwise handicapped persons hired at vending stands or cafeterias by blind employers be deducted from the "set aside" fee paid by the blind operator; require that blind and other physically disabled persons be entitled to all housing accommodations offered to other members of the general public, the so-called "fair housing for the blind" bill; provide reader services for blind persons who are not recipients of federally-assisted vocational rehabilitation services and who are students in any university or college in the State; appropriate the sum of $35,119 to the Department of Rehabilitation for the sole purpose of obtaining additional vending stands and food service operations for blind operators; require the prompt mailing of warrants to recipients of public assistance; permit flexibility in the setting up of home make services by county welfare departments and requires preference in hiring homemakers be given to recipients of public assistance. Legislation which the Council was successful in opposing would have done the following: incorporate a responsibility of relatives provision in the Aid to the Disabled program; write in lien provisions in all of the adult aid programs; reduce drastically the amount of assistance received by a married couple living together; make recipients pay part of the cost of medicaid (Med-Cal) if they had three hundred dollars or more in cash; bar a cost-of-living increase if the Federal share was increased and passed on to the recipients in any year; and a closed-end appropriation for all expenditures of aid payments. The following measures which were sponsored by the Council, and which were lost largely because of a very tight fiscal situation and the present flux in governmental reorganization plans in the State, would have done the following: create a California Commission for the Blind; increase the possible maximum for special needs in Aid to the Blind from fifty dollars to sixty-five dollars; increase wages to workers at California Industries for the Blind whenever the salaries of Civil Service workers were increased; grant to recipients of public assistance the same home-owners' property tax exemption as is now enjoyed by the general citizenry. At the close of the 1969 Regular Session of the Legislature, the California Council of the Blind can point to a record as good as that of any other organization or agency and better than most. It is true that we lost two of our major bills, the Commission and the property tax relief for welfare recipients, but we were fighting impossible odds on these measures this year. Lobbies far more influential than ours were losing their bills right and left. Esteem for the Council is high and bi-partisan. Next year's session will be acutely challenging. The push to create super-agencies will be even stronger than this year. The Aid to the Blind programs, which blind people in the State have worked for fifty years to create and improve, will be seriously threatened. We must study and keep abreast of the shifting trends in the field of public welfare so that we will be prepared for next year's confrontations. We might consider modifying our approach with regard to the Department of Rehabilitation and the Commission. We have several months to study, to think, and to exchange ideas. Let us not forget that we are all vitally affected by what happens in Sacramento from the school teacher in Crescent City (in the far north) to the farmer in Blythe (in the deep south). The larger the number of Council members who participate in the legislative program, the more effective the Council will be in Sacramento. Public funds will be even more fiercely guarded in 1970. Because of upcoming general elections, legislators will be particularly sensitive to the feelings of their constituents. The need for revision of school finances will be even more crucial. Many school districts will most likely run out of money before next June. The 1970 General Session of the California State Legislature will be exciting and difficult, but the Council is equal to the challenge. August 8, 9, and 10 found more than one hundred blind Idahoans in Boise for the annual convention of the Gem State Blind. The convention began with a board meeting Thursday evening. Friday morning was taken up with registration followed by a picnic. We got down to serious business in the afternoon with reports from all state officers and committee chairmen as well as a report from each chapter president. The Executive Board made a unanimous recommendation that the Gem State Blind seek to inaugurate a statewide fundraising drive which, when brought before the full membership, was approved with enthusiasm. At the present time the state organization and the chapters are working out the details. The membership adopted legislative priorities for the upcoming 1970 session. These were: (1) to fully support the expansion of programs of the Idaho Commission for the Blind including the establishment of an orientation center; (2) to secure a "little Randolph-Sheppard Act" for Idaho; and (3) to seek a floor of $130 Aid to the Blind payment. We also adopted a resolution publicly commending Representative Orville Hansen, Senator Frank Church and Senator Len Jordan for their co-sponsorship of the NFB's Disability Insurance for the Blind Bill. Now all but one of the Idaho Congressional Delegation has sponsored this vital national legislation! NFB First Vice-President Donald Capps presented the banquet address Friday evening. He talked to us about "What Makes an Organization of the Blind Tick?" His address was most interesting and valuable. Most of Saturday morning was given over to a full discussion of the NFB convention in Columbia, South Carolina. Members who attended the convention served on the panel. Kenneth Hopkins, who chaired the panel, garnered a great deal of enthusiasm and we expect an even larger contingent at the next convention in Minneapolis than the thirty-seven who went to Columbia. As an indication of this enthusiasm, two hundred dollars was raised from the membership for the Dr. tenBroek Endowment Fund and the IFB. The remainder of the morning session was given over to an informative talk by Mr. Bill Hallock, past District Governor of the Lions, who told us of the new sight conservation program which is soon to be established by the Lions of Idaho. At the noon luncheon Kenneth Hopkins, Director of the Idaho Commission for the Blind, addressed the assembly, bringing us up to date on the accomplishments of our Commission. He stressed the great value of the organized blind and the agency working in harmony toward a common goal as is the case in Idaho, and how this has aided the agency in making the great strides it has in its less than two years of existence. The afternoon session began with a panel discussion of services available to the blind through vocational rehabilitation, welfare, and other federal projects. This panel was ably chaired by Don Capps with Jesse Anderson and two federal representatives participating, Jerry Butters of the Salt Lake Regional Library and Helen Miller, Idaho State Librarian, who discussed available library services. Late Saturday afternoon the University Federation held its convention meeting where they enthusiastically agreed to work with the NFB Student Division on its projects and fully participate in the statewide fundraising project of the Gem State Blind. At the Saturday night buffet, President Uldine Thelander presented "The Idaho Story", taking us on a journey from the beginning of the organized blind in Idaho to the present. We found the history interesting and the accomplishments challenging. The new officers were also installed at this time. They are: President, Uldine Thelander; Vice President, Chuck Walhof; Treasurer, Alice James; Recording Secretary, Jan Omvig; Corresponding Secretary, Bonnie Whittig. Throughout the convention events were enlivened by the drawing of many fine door prizes in true "Urena" fashion by Larry Reynolds. The convention closed Sunday following the traditional Lions' picnic breakfast. Chuck Walhof, convention chairman, and his committee members are to be commended for bringing us a fine, productive convention in 1969. Our thanks too to Don Capps and his charming wife Betty, for their valuable assistance. Other out-of-state participants included Chuck Ferrer, First Vice President of the Washington State Association of the Blind. 1958 to 1966—President of Los Angeles County Club of Adult Blind, now Active Blind, Inc., affiliated with the California Council of the Blind. 1960—Appointed Executive Secretary of the American Brotherhood for the Blind, and still in that position. 1964—Appointed White Cane Week Committee Chairman for the National Federation of the Blind and still working in that capacity. 1967—President of the California Council of the Blind and still holding that office. 1968—Elected as a member and Treasurer of the Board of Directors of the American Brotherhood for the Blind, and still holds that office. To this may be added other community and state organizations and committees in which Tony is active either as a member or as an advisor. Most of the work is expedited through a very efficient office at 205 South Western Avenue, Los Angeles, California 90004. From there flow the many communications to the fifty-one chapters of the California Council of the Blind, NFB state affiliates dealing with the White Cane Week Committee and the administrative business of the American Brotherhood for the Blind. The California Council of the Blind was founded by Dr. Newel Perry in 1934 with the enthusiastic assistance of some of his former and then current blind students from the California School for the Blind. Under his determined leadership, flanked by a corps of young graduates, and utilizing their special talents and professions, Dr. Perry began to build a state-wide organization which was to pioneer programs for the blind in the State of California and which were to set a pattern for the rest of the nation. One of the first assignments was the improvement of welfare grants under the Enabling Act and from there began the long series of achievements and accomplishments in behalf of blind persons. The Council through its leadership and its strong supportive membership has been directly responsible for countless gains and improvements made in the past thirty-five years. Among them are the vending stand program, the Orientation Center for the Blind, credentials for blind teachers, elimination of residence requirements and the responsibility of relatives, the escalator clause applied to the aid grant based on the rise in the cost of living, the Model White Cane Law, reader funds for blind students, field services for the adult blind and numerous items of legislation aimed at improving services to blind children and adults. In an even more positive way, the California Council of the Blind established a scholarship program, the Dr. Newel Perry Scholarship Fund, which now annually awards nearly $4,000 in scholarships. This program was started some eight years ago with the awarding of a single scholarship of $250. Last year twenty awards were made which amounted to $3,800. The California Council of the Blind holds firm to the teachings and philosophy of its great leaders, Dr. Newel Perry and Dr. Jacobus tenBroek. It is a large organization representing all areas of the State of California and its many fields of endeavor. The fifty-one chapters, each active in its local area, are all in close communication with the state organization. Two semi-annual conventions and two annual seminars are the vehicles for concerted action. It is constantly engaged in a team effort with the total membership participating in all projects sponsored by the Council. As we look ahead we strive to become ever greater, ever stronger. The first ten days of August, 1969, will make their mark in the history of the organized blind movement in Illinois, for it was during that short period that the Illinois Congress of the Blind not only celebrated its first anniversary, but also witnessed the crowning fruits of twelve months of labor in the signing into Illinois law, at 4:13 P.M., on Wednesday, August 6, of House Bill 629, the Model White Cane Law, the "Bill of Rights" of the blind of Illinois. Work on the introduction of House Bill 629 had begun in January, 1969, and was coordinated by Jim Nyman, the then chairman of our State Legislation Committee. Copies of the proposed law and a tract explaining its provisions were mailed to all State Senators and Representatives, with a request for sponsorship and support. The response was most encouraging and on Monday, March 17, Jim Nyman, accompanied by Bill Myers and Bob Deane, made their way to the state capital, Springfield, in order to testify at committee hearings on House Bill 629 and its senate twin Senate Bill 329. The senate bill was sponsored by Senator Frank Ozinga, and the house bill was sponsored by Representative Eugene Schlickman. Support for the two bills in the hearings was highly favorable with the only opposition expressed, somewhat surprisingly, by the Lions of Illinois whose representative claimed that the date of October 15 laid down for the Governor's proclamation of White Cane Safety Day would interfere with the Lions' Annual Candy Day for the Blind campaign. However, following some behind-the-scenes discussions, it was finally agreed that the date of the proclamation be left open to the discretion of the Governor. On Thursday, June 19, the wires buzzed with the news that the White Cane bill was through the legislature, with only the Governor's signature separating it from the law books. Immediately, the ICB sprang into action with telegrams, letters and telephone calls to Governor Ogilvie, urging him to sign into law House Bill 629. On Wednesday, August 6, upon the request of the Governor, Rami Rabby flew to Springfield in order to be at the Governor's side at the moment of enactment of the White Cane Law. It was as if the legislative process had been synchronized with the countdown for the first annual convention of the Illinois Congress of the Blind which took off at 8:00 P.M. on Friday, August 8. The press, radio, and television of Chicago were still broadcasting the news of the passage of the Model White Cane Law as the blind of Illinois gathered at the Ascot House Motel for the convention weekend. Just as one year earlier, Mr. and Mrs. Jernigan journeyed to Illinois with a task force of organizers, so, one year later, the Illinois Congress of the Blind was elated to welcome again as their guests Mr. and Mrs. Jernigan with a different group of students from the orientation center at the Iowa Commission for the Blind, as well as Jim Gashel and Loren Schmitt. Nearly one hundred persons were present as John Cardinal Cody, Archbishop of Chicago, gave the initial invocation of the convention. The Friday evening session was devoted entirely to a presentation by Mr. Alfred Slicer, Director of the Illinois Division of Vocational Rehabilitation, who spoke of the work of his agency in the field of vocational rehabilitation of the blind. Mr. Slicer's remarks were followed by an extremely lively question and answer session in which Mr. Jernigan himself and many of the audience actively participated. The Saturday sessions were largely devoted to the transaction of organizational business. Reports were given on the Illinois Congress of the Blind's activities during the preceding year, and on the recent NFB Convention at Columbia, South Carolina. Much time was devoted to the ICB's past and future legislative programs. Mr. Jernigan suggested a possible legislative program for the coming biennium centering upon an attempt to liberalize the Aid to the Blind laws in Illinois. He also fielded a variety of questions on NFB philosophy, aims and current activities. Four positions on the Board of Directors (one of which had been vacated by Jim Nyman who will soon be joining our Texas affiliate) were filled, and as a result of the elections the Board is now composed of the following directors: Rami Rabby, President; Don Roberts, First Vice-President; Bill Myers, elected Second Vice-President; Judy Byster, Secretary; Ron Byster, Treasurer; Fred Bixby, elected to serve out the second year of a two-year term; Bob Deane, Camille Myers, reelected to a two-year year term; Don Vogel, elected to a two-year term. The Saturday afternoon session closed with an extremely useful and informative presentation by Representative Eugene Schlickman who spoke on our White Cane Law, methods of lobbying, the legislative process, and much more, although he declined to answer questions concerning his current campaign for one of the United States Congressional seats from Illinois. The unquestioned climax of the convention came fittingly at the close of the proceedings, on Saturday evening, when one hundred and fifteen persons attended our first annual banquet. Mr. Jernigan gave the banquet address, and among those who came to share our celebration and listen to our national leader were Senator Ozinga and Representative Schlickman and their wives. Mr. Jernigan's address was truly superb in both form and content, and not only left our legislator friends speechless with admiration, but more importantly, fired and reinforced our determination to continue our work in our second year with the same enthusiasm and momentum as we had demontrated in the first. Moreover, as a result of our experience in organizing our first convention, we are all the more confident of our ability to host the NFB's convention in Chicago in 1973. On September 4, by motion in the Senate Chamber, forty-eight Senators joined Senator Randolph as co-sponsors of S. 2461. Provide for judicial review of decisions affecting the vending stand program. If the proposals contained in S. 2461 are to become Federal law, blind people, their families and friends, must let loose a flood of letters on Washington in its support! And only masses of letters will do the job! Opposition to the Vending Stand amending bill has already appeared! A national organization of federal employee associations—which are receiving vending machine income for their social, recreational, and benevolent activities—have already started a campaign to "kill" S. 2461. First and most important of all, letters should be sent to Senator Jennings Randolph, original sponsor of S. 2461. And your letters to Senator Randolph should thank him for his continuing concern and constant efforts in behalf of blind people. Tell him just how beneficial the vending stand program has been over the years in providing livelihood opportunities to blind people. Tell him if his bill is not enacted into law, many blind men and women now operating vending stand businesses may be "squeezed" and "starved" out of business, may lose their chance to earn a living and will have to apply for public assistance! Tell him if present trends are not stopped by the enactment of his bill into Federal law, the possibilities for employment of many additional blind people who could support themselves and their families from vending stand earnings may remain unemployed even though they are employable. Given a chance for the kind of employment offered under the Randolph-Sheppard Act, these people could become independent, self-sufficient and tax-paying, family-maintaining citizens. At the conclusion of this article are two lists of United States Senators. The list entitled "Vending Stand Bill Honor Roll" contains the names of the Senators who are already co-sponsors of S. 2461. If your Senators are on the "Honor Roll" list, write them along the lines suggested above. If your Senators are not on the co-sponsor list, you will find their names on the list headed "Not-Yet Co-Sponsors". It is up to you to persuade the not-yet co-sponsoring Senators that they should join the "Honor Roll" of S. 2461 Senate supporters. The foregoing suggestions will help you with ideas and arguments for your letters. Letters to Senators should be addressed: The Honorable -––-, Senate Office Building, Washington, D.C. 20510. North Carolina Sam J. Ervin, Jr.
Maryland Charles McC. Mathias, Jr.
Virginia Harry F. Byrd, Jr. Governor Ronald Reagan made a frontal attack on his State's welfare programs when, very early in the session of the Legislature this year, he openly advocated and ernestly fought to have enacted into law bills which would place a responsibility of relatives provision in Aid to the Disabled; impose the hated lien provision in Aid to the Blind, Old Age Security, and Aid to the Disabled; provide for drastic reductions when a couple, both receiving public assistance, lived together; make recipients pay part of the cost of medicaid if they had more than three hundred dollars; bar a cost-of-living increase if the federal share were increased and passed on to recipients; and provide for a so-called "closed end" appropriation for all welfare costs, thus requiring the Legislature to make any special appropriations required if caseloads exceeded estimates in the State's budget. Fortunately, the Governor was sternly rebuffed by the Legislature in his attempts to wreck the State's relatively adequate welfare programs. The Governor and his administration then turned to administrative devices to cut welfare. In 1968 the Legislature passed Assembly Bill 361 to provide a means for a more equitable and appropriate determination of the amount of aid to be paid in the adult categories as future increases in aid grants are voted by the Legislature through a simplified standard of assistance. This measure, however, specifically provided that it was not the purpose of the new law to reduce the amount of aid that is payable to the individual recipients under the several amount-of-the-grant sections of the Welfare and Institutions Code. Totally disregarding these legislative guidelines, the Director of the State Department of Social Welfare revised the special need for laundry service from a maximum of eleven dollars a month to a flat four dollars a month and only if the service were provided outside the home. This meant a reduction in the grant for 51,124 recipients of Old Age Security and Aid to the Blind. Next, the allowance for a telephone was reduced from the minimum monthly rate for phone service to a flat four dollars a month, two dollars if shared. This meant a reduction in the grant for 9,287 recipients. Finally, the special need for yard care of S4.50 a month was reduced to zero, meaning a reduction in the grants of some 37,027 recipients. Thus a total of 97,438 recipients of Old Age Security and Aid to the Blind will suffer cuts in their grants of assistance because of these revisions in the regulations governing special needs. "We think it is decidedly reprehensible to make policy changes which will mean marked decreases in grants for large numbers of recipients at the very time that costs for these special needs are rising rapidly. While the overall maximum grant may be increased in accordance with the cost of living, this is really not meaningful unless the ceilings on the various special needs are also increased. "We point out that Section 11182 of the Welfare and Institutions Code specifically provides that it is not the purpose of Article 6, Simplified Standard of Assistance, to reduce the amount of aid that is payable to the individual recipient. With this firm statutory guideline in mind, we do not believe that any changes which would result in a decrease in the grants to any appreciable number of recipients are permissable and it is clear that the changes you contemplate are in direct violation of a statutory injunction. "Your staff pointed out in discussions with us that no additional funds will be made available by the Legislature this year and that to have simplification was impossible unless some grants were reduced and others increased. This is exactly the concern which we expressed to the 1968 Legislature and which resulted in the language in Assembly Bill 361 specifically precluding the reduction of grants and requiring that simplification be accomplished when additional funds were available. Moreover, the savings that would be accomplished by the kind of simplification now being considered are illusory or nonexistent. As with most gimmicks in welfare, standardization of special needs has been vastly overemphasized because it has popular appeal to legislators and others. If real administrative savings are desired, we would recommend first, the adoption of the system of determination of grants on the basis of an application or affidavit and second, redetermination of the grant only at one year intervals, unless there has been a substantial change in circumstances. "The California Council of the Blind thus opposes these contemplated changes not only on humanitarian grounds but also on legal grounds." The State Department of Social Welfare, meanwhile, is blithely proceeding with the revision of other special need allowances—special needs for utilities, for transportation, for housing repairs, for household furniture and equipment, etc. The Reagan administration should be able to cut the grants of another one hundred thousand recipients before it finishes the list of special needs. Certainly it is obvious that, by one means or another, Governor Reagan is determined to crack down on recipients of public assistance. The only thing which may stop him is an appeal to the courts, which is now being contemplated. The first state-wide meeting of the Connecticut Federation of the Blind was held September 6, at Southern Connecticut State Teachers College, New Haven, Connecticut. President Francis Flanagan of the Connecticut Federation of the Blind, his fellow state and local chapter officers, and others had expended much effort in preparing for the one-day long event, and these efforts had been all directed toward the goal of securing the attendance at the meeting of as many as possible already-Federationists and not-yet Federationists of Connecticut. The result: 258 blind men and women came through the pouring rains from every part of Connecticut to be at the New Haven gathering. And of this total, state leaders estimated that at least sixty percent had never been to a Connecticut Federation meeting before. The Seminar featured a panel on employment of the blind. Chaired by Nick Leacraft of the Connecticut State Labor Department, Employment Security Division, the panel consisted of: Dr. Berner, Chief Psychologist, West Haven Veterans Hospital; George "Buck" Gillespie, Chief of Blind Center Rehabilitation, West Haven Veterans Hospital; Stanley Berwald, President of Plastics and Nylon, Inc.—and a satisfied employer of handicapped workers; Charles Phelps of the Liberty Mutual Insurance Company, and a member of the "Employ the Handicapped Committee"; and W. Duncan of the Connecticut State Board of Education for the Blind—Connecticut's Vocational Rehabilitation for the Blind Agency. Following brief formal presentations by each panelist, a flood of searingly searching questions commenced. John Nagle, the Federation's spokesman in Washington, cross-examined panel speakers in fine Perry Mason style. Particularly, John focused attention on the right of every client of a vocational rehabilitation program to a fair hearing when he is dissatisfied with the services, or lack of services, he receives. Mr. Duncan of the state Vocational Rehabilitation for the Blind Agency, explained that when a client of the agency requests a fair hearing, a supervisory review of the case is made. Nagle described this "fair hearing" procedure as though "I killed a man, and all members of the jury to try me for this murder were his brothers and sisters!" Nagle urged blind people to avail themselves of the existing Fair Hearing procedure whenever they have complaints with agency assistance. "Frustration", "disgust", "anger", "confusion", are apt words to express the feelings of the blind members of the seminar audience as they asked questions, and talked about their unhappy agency experiences: "I haven't heard from my vocational rehabilitation counsellor in six months!" "I haven't heard from my vocational rehabilitation counsellor for fifteen years!" ' A blind person was trained for a vending stand and there was no stand when the training was completed, so she was told she must accept training for typist-transcriber!" "I asked my counsellor for guidance on a career, and he has refused to help me!" This last person has training both as a pharmacist and a computer programmer before loss of sight, worked for NASA on computers before blindness, and although he tried very much to help himself and find his own employment opportunities, he looked to his vocational rehabilitation counsellor for help and advice and has received none! Francis Flanagan, leader of the organized blind of Connecticut, told of state laws enacted because of the Connecticut Federation's efforts. John Nagle reported on the NFB's proposals now pending before Committees of the 91st Congress. Franklin VanVliet, NFB Treasurer, John Nagle, and Francis Flanagan all spoke throughout the day, on the importance of a strong and active organization of the blind in the lives of blind people. And the state and national Federation leaders urged Federationists to be more active. The day's "revival of Federationism" meeting was concluded by a banquet attended by two hundred and forty blind people and their families and friends, and John Nagle delivered a thought-provoking address. When the banquet was over, when goodbyes had been said, and thanks given, Flanagan, VanVliet, and Nagle post-mortemed the day—and they all agreed that much had been accomplished: As the day progressed, more and more blind people dared to speak of their complaints, had the courage to openly question and criticize the agency; many blind people present expressed a wish to become a part of the organized blind movement. The unanimous opinion of Flanagan, VanVliet, and Nagle was that Federationism in Connecticut had undergone a rebirth on September 6—that old members and established chapters will show greater vitality and activity as a result, that new chapters will be formed, that many new blind people will come into the organized blind movement in Connecticut. Civil Service Examination for Blind Applicants: In the case of an applicant who is blind, the Civil Service Department shall provide him with a braille examination, the services of a reader or whatever else is necessary to give him the same opportunity as other applicants. Training Workers for Rehabilitation of Blind (Dept. Bill): The State Services for the Blind is authorized to employ on a part time basis eight student trainees in graduate school programs (instead of the four previously authorized) without their counting against our complement. Limits Relative Responsibility in Aid to Blind Program: The liability of relatives for the support of a blind person receiving assistance is limited to "spouse, or parent of a minor child". Claim against Estate of Aid to Blind Recipient: Section 256.65, which permits the filing of a claim against the estate of an AB recipient, is modified to provide that the claim is nullified if during any three year period subsequent to the receipt of assistance a blind person remains off the assistance rolls. Notice of Change in Aid to Blind Grant: In any case where the county agency is about to decrease the amount of an aid to the blind grant, it must give the recipient thirty days advance notice of such action. Resolution re abolishing Residence Requirements in AB Program: This resolution memorializes Congress to abolish residence requirements for all federally supported programs for aid to the blind. Appeals Permitted in Blind Rehabilitative Services: An applicant or recipient of rehabilitation services for the blind who is dissatisfied with the state agency's action with regard to the furnishing or denial of services is provided an opportunity for a fair hearing through the agency structure. If he wishes to carry the matter further, "his grievance shall be considered and relief, if any, recommended by an appeal committee." The committee shall be composed of one person nominated by the applicant, one by the state agency, and the third person nominated jointly by the other two. Special Classification of homesteads of Blind Persons: Provides that the homesteads of blind persons as defined in Minnesota Statutes, Section 256.12, Subdivision 11, are entitled to the benefits of the class 3cc low rate of value, the first eight thousand dollars of adjusted market value will be classified at five percent. Civil Rights Bill for the Blind: The Minnesota Legislature enacted the Model White Cane Law in full. BE IT FURTHER RESOLVED: that a copy of this resolution be mailed to Mrs. Jacobus tenBroek and Mr. Kenneth Jernigan, President, National Federation of the Blind. The attached letter and brochure, I am sure, will strike a happy note with you. (You undoubtedly will receive a copy in connection with our general mailing.) However, I wish to emphasize as much as I can possibly do so, the wonderful cooperation which you and the National Federation of the Blind provided in connection with the legislation leading up to this wonderful development. I hope that you will find some means of carrying this message to all of the Federation membership, as we want them to know how deeply grateful we are to the Federation for playing such an active role in getting the idea of the Center on the road and then following through to the ultimate award of the Center to IHB. I am sending a similar letter to John Nagle, who provided yeoman service and counsel. The National Center for Deaf-Blind Youths and Adults was awarded to IHB on a never-to-be-forgotten occasion at the commencement of the National Citizens' Conference on Rehabilitation of the Disabled and Disadvantaged, in Washington, D.C., when the letter of understanding was signed on June 24, 1969, by Dr. Mary E. Switzer on behalf of the Government, and Mr. John H. Finn, President of IHB. The purpose of this letter is to express thanks to you and all those who participated in the development of the idea of the National Center, which was consummated on October 3, 1967, when President Johnson signed the 1967 Amendments to the Vocational Rehabilitation Act. We do not look on this as a miracle program, but one which will take advantage of the experience of the IHB staff built up under the Anne Sullivan regional program, which will serve as the nucleus for the National Center. We shall promptly get under way the development of additional staff and will work closely with all those interested throughout the United States in the provision of services for deaf-blind youths and adults. We look on our task as one involving understanding, dedication, and faith that deaf-blind youths and adults can take their rightful place in the community if given adequate counseling and training. We know this will involve not only what we at the National Center will be able to do, but also, very importantly, a continuance and further development of the good relationships that have been built up in other States, particularly those fifteen States along the Eastern seaboard which have been involved in the Anne Sullivan regional program sponsored by RSA and IHB. Though Helen Keller died on June 1, 1968, she knew that a better day was in store for deaf-blind children, youths, and adults. It is significant that the Anne Sullivan Macy Service for Deaf-Blind Persons was concluded on June 27, 1969, Helen Keller's 89th birthday, and the next day marked the official beginning of the National Center for Deaf-Blind Youths and Adults. So, as we think lovingly of Helen Keller and her life's work, we can say, "Well done! Mission accomplished!" The father of Nellie Cardwell Hargrove, President of our Tennessee affiliate, was shot and killed as he conducted services on Sunday evening, September 7. The Reverend Thomas Robert Cardwell had recently established a congregation in the community and plans had been made to build a church. While these plans awaited fulfillment, services were conducted in the home of Oscar Haney, a blind parishioner. The congregation had gathered in the Haney home, as it had done for some months, for the usual Sunday service. As he preached he was shot by a member of the congregation, Frank Foust, who had been working with him on the church project. Mr. Foust stood on a nearby hill and used a high-powered rifle equipped with a telescopic sight. The bullet came through the living room window, struck Reverend Cardwell in the right shoulder, severing an artery, and ranged down to exit from his back. He died almost instantly. The Missionary Baptist Minister had founded a number of churches in the area and served as pastor of others. The new congregation to which he was preaching is the Blue Haven Baptist Church. The Reverend Cardwell was a widower and just seven days before his death had married the former Flossie Mildred Barns. Some forty-five minutes after the killing, Foust and his father went to the county jail and there Foust confessed. The sheriff said that Foust is a mental case in his judgment. Foust was given a medical discharge from the Navy after suffering shell-shock. We know that all Federationists join in extending to Nellie and her family our deepest sympathies. I know nothing to say except a sincere "Thank You" for the flowers, hundreds of cards and letters, and many local and long distance calls I received when my Father was killed. Each expression of sympathy and concern was a source of great comfort to me and to my brother and sister. I was overwhelmed by your tremendous response to the news of my Father's tragic death. My Father, a Baptist minister, was struck down by a bullet from the rifle of an insane man as he stood delivering a Sunday Evening message at a prayer service in a private home. His slayer is hopelessly insane and is now locked securely behind bars where he can do no further harm to humanity. This man had sought counsel from my Father and in his disturbed state of mind he had come to believe that the advice which Father had given him had in some way caused him to be a sinner. Of course, Father was not aware that the man was insane when he had attempted to advise him. Having gone blind at the age of forty-five, Father taught himself braille, learned to travel with the white cane, and went to night classes and learned to use the typewriter. He took his blindness as a part of his life, collecting the entire Bible in braille as well as many other religious publications. Physically, he was a big man, standing six feet and six inches tall and weighing over two hundred pounds. In character, he was a giant. All of the family as well as most of his community leaned on him in time of trouble or sorrow; he was always strong, truly being one of the most intelligent people I have ever known. He loved life. Once he told me that every day was a completely new experience for him. With his death, an East Tennessee community lost a leader and the Tennessee Affiliate lost a loyal and devoted member. We buried my Father in the family cemetary which is within the boundaries of the Great Smokey Mountains National Park, land which was granted to my Great Grandparents. There, just four months before, we had stood with Father at the last rites for my Mother. As I walked away, through the rustic old gates, I looked back with unbearable grief and bitterness and I vowed to forever withdraw myself from society. Yesterday, I returned again to the graveside of my parents, and as I knelt to place a small bouquet of autumn flowers on the grave, I felt no bitterness. Instead, although I felt a great emptiness in my heart that I knew would never be filled, I knew a great feeling of gratitude. I was grateful that a gentle Southern lady and a fine Christian man had raised me: had seen to it that I was educated; had given me a sense of value for the truly good things in life; and, most of all, had taught me to be strong and to know that life has a meaning and a purpose. When I walked again through the rustic old gates, I did not look back. I looked forward; forward to my responsibilities to society; forward to living the kind of life that I had been taught to live; forward to finding each day "A New Experience". Standing alone for a few minutes, I listened to the light wind and the gentle ripple of a near-by stream and I knew this to be a place of peace and beauty. I felt the warm September sun on my face and I was grateful for life and for all of the fine things in it. When the Greater Lawrence Association of the Blind, Inc., Massachusetts, began their discussions about the White Cane Drive, they determined that it would be a project that the blind themselves would do with as little help from the sighted community as possible. A new member of the Association, Freeman Downing, told the group about his work with antique cars. Although legally blind, Downing is known nationally for his work as chief pit mechanic for several racing cars and his involvement with antique car restoration is a hobby extension of his vocation. President John Borrelli appointed a Committee of the Whole with Mr. Downing as Chairman to investigate the possibility of holding an Antique Car Rally as the Association's White Cane Project. Each blind member was assigned to one phase of the preparations and each committee had a sighted helper, a prominent member of the community. Prior planning, ordering and in many cases, implementation of the plans was the sole responsibility of the blind members. Committees were ably headed by the following: Shaban Numan, Grounds; Dominic Fiato, Publicity; John Borrelli and Mrs. Daniel J. Kiley, the wife of the mayor of the City of Lawrence, Dignitaries; Arthur Sevigny, Registration; Elizabeth Downing, Prizes; Victor Jedry, Tickets; and Paul LaSonde, with the aid of Charles Conlin, Refreshments. The drawings for the admission prizes were capably handled by Bill Borrelli of radio station WCCM (no relation to John Borrelli) and musical entertainment was provided by the Barbershop Quartet headed by George Zermis. The Association was determined that they would stress abilities rather than disabilities and in this context the Antique Car Rally was an unqualified success. The Governor of the Commonwealth of Massachusetts, Francis W. Sargent, honored the event by issuing a proclamation (see accompanying photo), which was presented to Mr. Borrelli and the Association by Representative Paul W. Cronin. Invitations had been sent to all the major Antique car clubs of Essex and Middlesex counties in northeastern Massachusetts. Antique car owners are, usually, reluctant to publicize their rallies for fear that large crowds will damage these valuable old cars. The Greater Lawrence Association of the Blind, Inc., was most pleased by the tremendous response of the car clubs and most grateful to be able to report that their fundraising project for the White Cane Drive was attended by a good sized, well-behaved crowd, many of whom were especially impressed by their discovery of the varied talents and great competency of the blind. Finally, the Association is most happy to report that in addition to improving the image of the blind of the community, they were also able to send $225 to the National Federation of the Blind as their portion of the proceeds. The author imputes to public and private agencies engaged in work for the blind and to the stereotypes about blindness that are inherent in society generally, a large part in the teaching of that role. He does the blind of this nation a great service by bringing before professional and lay reader alike the facts, fallacies and fictions about those agencies, which he calls blindness agencies, by describing what happens to the unfortunate persons who seek their help. Scott indicates that nearly two-thirds of these organizations "cater exclusively to either children or non-aged adults; and at least 60 percent of all economic resources, exclusive of income maintainance, are earmarked for these two groups." [p. 69] Consequently, "Socialization experiences that occur in organizations for the blind are therefore reserved for a small, somewhat elite portion of all blind people." [p. 70] Scott then further limits this study to those within this group who were adventitiously blinded. He sees the main difficulty in the first stage as resting in the definitions of blindness now provided especially since they may include persons with very serious visual losses, who are still able to see. [p. 72] These persons, he feels, should be taught to live as sighted people. But the blind person, totally without sight or otherwise, who goes into an agency for rehabilitation faces risks familiar to our readers. The agency quickly convinces him that they know better than he what is good for him. If the blind person wants to get along he learns that the only way to accomplish what little he can, is to agree with the "professional" personnel into whose care he has come. He must learn to conform to their ideas about his disability and abilities, physical, medical, social, or psychological. If he does he will be rewarded; if not, he will be punished. The professionals have very limited ideas about his capabilities and assiduously subvert his ideas on this subject. He soon learns to accept their judgment about him and to play the role they have assigned to him. Thus, in the end, he goes back to his community, to a sheltered shop, or to work with the agency to act the way the agencies have taught him the rest of the world expects him to act. Since the ideas about how blind people ought to behave are as firmly fixed in the public mind as in that of workers in the agencies, the pressures from family and friends to so behave are reinforced. Since workers in blindness agencies are part of the general population and the people who have difficulty seeing are also part of the general population and come ready equipped with all the notions about blindness that the general population has, it is not difficult for Dr. Scott to conclude that "Socialization processes that occur in blindness organizations could be salient for all persons who have been identified as blind" except that he makes it plain that "could be" must be read as "is". Since that group is estimated at ten percent, Dr. Scott does the other ninety percent of the blind population in this country a great disservice: He generalizes a set of norms for the blind as a whole from what he observed in a small and limited group. We know that Dr. Scott has a purpose in his study, that he has drawn some conclusions, and made some generalizations. As he indicates above, he attempts to define his classes and make his classifications. He sees classification as using what one knows about group A to generalize about groups B, C, and so on. Having set out the logical steps, or some of them, how successful is he in their application? So Dr. Scott concludes that "Blindness is a learned social role." —Well, most times. If the application of a basic classification is applied to subjects which have characteristics in addition to, or fewer than, those used, the classification is faulty. It is, therefore, either overinclusive or underinclusive. All that follows from such an application of the basic classification would be subject to the basic fallicies inherent in it. Since the traits found in those who do go to blindness agencies are not "uniformly" found among the rest of the blind population, the basic classification is faulty even though similar traits may be found among some of the blind who have never been in contact with a blindness agency and even though the traits may be lacking in some who have been in contact with a blindness agency. The people studied all have one trait in common—they have, as Dr. Scott likes to put it "difficulty seeing". But beyond that Dr. Scott falls victim to scientism—the crude application of the scientific methods of the physical sciences to all fields of investigation. While one may examine and test scientifically and, consequently, discover the properties of physical phenomena, the attempt to apply like methods to human behavior must take into account that very human behavioral fact. On what grounds does he base his claim that for all blind people blindness is a social role which must be learned, and having been learned, played? Well, one shouldn't say "all". He does exempt some: the independent blind who are either veterans or beggars and the few others who have either "wealth, fame, or talent with which to purchase the assistance they need" to live successfully in the sighted world. In his conclusion Dr. Scott states that "The major thesis of this book has been that blindness is a learned social role. People whose vision fails will learn in two contexts the attitudes and behavior patterns that the blind are supposed to have, in their personal relationships with those with normal vision and in the organizations that exist to serve and to help blind people." "The relationships between sighted and blind men contribute to the socialization experiences of blind men in a number of ways. The misconceptions of the seeing about the nature of blindness and its impact upon the personality and behavior are expressed as expectations of the blind person's behavior. When he encounters a sighted person, the blind man usually feels that he must act in the way expected of him." Here we have a problem with the author's generalization. He has limited his study to the adventitiously blinded. Most of these probably had some experience with more or less normal sight before becoming blind. Having been sighted, why should their stereotypic beliefs be different from that of any sighted person? "Some actually come to believe in these stereotypes themselves and internalize them; others insulate the self from them by various actions. In either case, the beliefs are a fact of life for people who are blind." That is, some people have a limited notion about the abilities of those who have lost their sight, whether they be blind or sighted. And with this the Federation would heartily agree. Federationists can also agree when the author continues: "Blindness is also a condition that stigmatizes." But we cannot assent when the good Doctor continues: "The social identity of a man, indeed, his whole personality, is spoiled when he is blinded..."
"Another set of socializing facts relates to the mechanics of dealing with someone who is blind. The norms that govern the conduct of the ordinary relationship of everyday life depend enormously on vision....Furthermore,...blindness denies [the blind man] the honest, direct feedback essential to the development of a realistic self-concept." This may be true of some segment of the blind population, but again, the danger of generalizing from an underinclusive group is apparent. "Finally, because of the very nature of his condition, a blind man must rely on his sighted companions for assistance in the most ordinary situations, but he is restricted in his ability to reciprocate. Such encounters inevitably become relationships of social dependency....For all these reasons, blind people have difficulty establishing secure relationships with the sighted whom they regard as their intellectual equals. Here again, the blind man is poignantly reminded that he is different and less a person than others." These conclusions come from explanations set out in Chapter 2: The Socialization of the Blind in Personal Interaction. In that chapter he enlarges these ideas. First he asks the question "Why do people enter into associations with one another?" [p. 33] And answers: "[O]ut of a desire to obtain the social reward of gratitude, reciprocity, and social approval,...His desire for social rewards and his perception of the probability of their realization motivate one person to associate with another." One cannot help wondering whether in the context given above the word "gratitude" was mistaken for "gratuitous". "We assess visible and inferred qualities to get some impression about whether or not persons are potential providers of the services we require." "The blind person is, therefore, by virtue of his dependency, the subordinate in a power relationship." So "charity" is a kind of power. Could one then not impute "power" to the blind if they withheld gratitude? "As a rule, none of the alternatives available to subordinates in power relationships are open to him. He cannot forego the service required, since performing important activities of daily life depends on the cooperation of sighted persons." Here again, all of the blind are victims of the author's overclassification. "It is unlikely that he will turn elsewhere, partly because he cannot always do that on his own and partly because his situation will be unlikely to change greatly if he does. Finally he cannot very well rely on force to have favors done for him. He is, therefore, backed into a position of compliance. Because of his marginal status, a blind man's compliance is only of limited worth to those who seek to gain powerful positions in the mainstream of society. Furthermore, the value of a blind person's compliance may be set off by the investment of time and effort required to render the service. For these reasons, many sighted people avoid encounters with the blind because they anticipate that the compliance of a blind person will be of little value to them. Once again, such avoidance is not achieved without feeling guilt. These guilt feelings become apparent whenever the blind and the sighted are thrust into one another's company." "These factors have several consequences for the blind person's socialization experiences in personal relationships. For one thing, since blindness is a social debit, it follows that blind persons will find it difficult to develop enduring associations with sighted persons who are otherwise their intellectual, psychological, and social equals. The fact that many blind people are not treated as 'normal' in this respect is the motive behind a common reaction pattern in the blind. Some people disavow their blindness entirely by learning how to perform activities that are normally reserved for people who can see. These include such activities as skiing, golfing, driving automobiles, or doing elaborate repairs on the house." It never seems to occur to Mr. Scott that perhaps blind people do these things because they enjoy doing them, or when it comes to repairing the house, may be driven by necessity, as are many sighted people in like circumstances. "While such activities can be performed by certain blind people, competence in them is attained at the cost of a tremendous personal effort." And this is wicked? Most competence is acquired by a good deal, even tremendous, personal effort, whether acquired by the handicapped or the nonhandicapped. "Even more fundamental than this, however, are the demoralizing and humiliating effects upon the self of continuously being treated charitably." Shouldn't one always treat others "charitably"? "The blind person comes to feel that he is not completely accepted as a mature, responsible person. As a second-class citizen, he must deal with the eroding sense of inadequacy that inevitably accompanies that status. Incidentally, it is important to note that this problem does not stem from the preconceptions others have about blindness; it is an effect of introducing the factor of blindness into the equation which describes the mechanics of interpersonal conduct." So, it is the blind person's responsibility since he is blind. And the stereotypes of blindness have nothing to do with it. If the stereotypes are not part of the interpersonal conduct, if, as he says on page 16 "A part of the socialization experience in any society involves learning attitudes, beliefs, and values about stigmatized people" then the preconceptions are perforce there, and he is contradicting himself. "There is one condition under which a blind person is able to escape this dilemma—the possession of a valued quality, trait, or attribute that he can use to compensate for his blindness. It is no accident that the blind persons who become most completely integrated into the larger society, possess wealth, fame, or exceptional talent. These people can exchange prestige or money for the favors they must accept in order to function in daily life. They are unusual. A majority of blind people are elderly and poor, two traits that also have very low potential attractiveness to others." The author does not here adhere to his decision to discuss only the adventitiously blinded—the educable young and the employable adult. How does he account for the growing numbers of blind people, whether born blind or not, who are increasingly becoming integrated into the larger society or at least have acquired the necessary skills to become integrated. He concludes that "The stereotyped beliefs and the stigma being contingencies no blind man can ignore, impose certain uniform behavioral patterns on those whom society labels blind." While NFB philosophy agrees with the first half of the sentence it is necessary to take vigorous exception to the last half. Scott himself denies and disproves this in the section on the "Independent Blind", however limited that view is. The tests he puts forth, whether valid or not, are applicable to any group or sub-group in the society. In most social—using the word to apply to the business of living in the world—relations one's feelings of adequacy or inadequacy, may vary with the situation, may affect his interaction with another person. On some other occasion, or in some other situation, and with some other person, he may in turn feel adequate, superior, charitable, or all or none of these things. To impute the feelings set out in this section to all the blind "excepting the exceptional", although exceptional is applied these days to any deviation from the norm, is utter nonsense. Tucked away in Chapter 7: Living Without Blindness Agencies, Dr. Scott acknowledges the existence of some other groups. Among them are "The Independent Blind". Again, they are in his words "able to 'make it' in the sighted world because they have enough wealth, fame or prestige to attract sighted people to them." [p. 108] He insists, in a footnote, that sighted people do not resist blind persons who possess these attributes "because the rewards from the affiliation compensate for the inconveniences." Those of us in the National Federation of the Blind know what patent nonsense, to say nothing of insufferable arrogance, such a statement is. Also included is a section on the blinded veterans. He outlines their better rehabiliatation, medical care, and income-maintenance programs, all considerably higher than for the civilian blind. He comes to what is for him a "dramatic" conclusion: "These data indicate in a very striking way how alternative approaches to rehabilitation can produce radically different socialization outcomes among blind people. Organization systems that are constructed so as to discourage dependence in fact produce independent blind people; systems that foster dependency by creating accommodated environments produce blind people who cannot function outside them." [p. 116] The other startling conclusion he comes to about the blinded veteran is that with his better support and rehabilitative programs, he can find little difference between the blinded veteran and his sighted neighbors in similar circumstances. How now the "uniform" classification? If the independent blind, for whatever reason, the blind beggar, and the blind veteran do not fit into his basic classification, how basic is it? The application of the common characteristics found in blind people by Scott do not apply to this group. Scott did not adhere to his basic classification—the adventitiously blinded of educable or employable age who go to blindness institutions. He attempted to generalize from that classification to others and the others had either additional or fewer characteristics. The consequence is that the whole structure is illogical and suffers all the weaknesses inherent in that quality. Because he says the independent blind are those with fame, talent, and fortune, he mentions not at all those with some or one of these. How does he account for, say, the eighty-six blind teachers in the public schools of California, teaching every subject in the curriculum including the sciences, and handling classes from kindergarten to graduate seminars. How does he see blind farmers, businessmen, lawyers, judges, mechanics, engineers, or the blind in the myriad other occupations who work successfully as employees or independently? Almost all of these people have come in contact with some blindness agency at some point in their lives. What Scott says about the blinded veterans' programs and their possibilities for the civilian blind, the National Federation of the Blind has been saying since its Foundation. It was summed up in HOPE DEFERRED, written ten years ago, thus: "The test of social thought and planning for the blind...is whether it meets or defers meeting these needs: whether it presupposes the normality and equality of persons who are blind or presumes their abnormality and inferiority; whether it recognizes both their right and competence to govern their own lives, or seeks to impose a protective custody and perpetuate a dependent status; whether it creates opportunity and encourages access to normal competitive pursuits, or erects artificial handicaps and arbitrary barriers; and finally, whether it provides public service as the right due to citizens or as the charity bounty due to wards and indigents." [Introduction, p. 2] Scott's attitude is the negative of the NFB's positive. Organizations of the blind and the effect they have had on the blind of the nation fit none of his possible "scientific" findings. But we know what he must think of them: "Since he has neither fame, talent, or fortune to exchange for the services he needs, his interactions with the sighted put him in the role of the social dependent and make him subordinate in the resulting power relationship. Since social likes tend to attract social likes, and since with a group of blind people he can obtain the psychic satisfactions he needs, it is only natural that he should seek that level of human companionship." How he would deal with our leaders and delegates some 1200 strong assembled in convention would be interesting to discover. Almost all, whether leaders, national or state, or recipients of welfare, have exhibited "exceptional" characteristics by the very fact of their presence. They travel to convention cities in the same way that their sighted fellows do, singly, in groups, with or without their spouses or other members of their families and always seem to be able to find their food, to say nothing of their drinks, in the same manner as sighted people at conventions. How would he deal with the fact that many of these people lead fully integrated, satisfying lives among the sighted? This work contains as many facts, fallacies and fictions as it sets out to expose. The mixture of facts and Dr. Scott's own opinions is sometimes difficult to sort out. The confusion worked by the basic fallacies of Dr. Scott's logic in the whole organization of the study and its generalizations is almost fatal. Dr. Scott tries to deal with a social phenomenon—blindness—in the context of "scientific theory" and consequently fails to get beyond the abstractions of "science" to social realities. While one might agree that difficulties of blindness stem from stereotypes based on superstitution and ignorance, it is astonishing, indeed, to find a sociologist of Dr. Scott's repute, reinforcing them so vigorously. Instead of suggesting that there may be ways of dealing with the problems thereby arising, he merely concludes that to live in the world, the blind not only do, but should, learn to play the role assigned them by ignorance and superstitution. Dr. Scott says that as "a first step toward the development of meaningful practice theory in work for the blind, it is suggested that the scientific validity of the beliefs of workers for the blind be critically assessed." One can assume that he means their beliefs about the blind and blindness. But why confine it to workers for the blind? Having admitted, in a negative way, that the problems really stem from everyone's beliefs about the way blind people ought to behave, why not use that as a starting point for basic reform. Changing only the beliefs of workers for the blind will not be of much aid to the blind person subject to their ministrations when he leaves their hands to confront the "real" world unless everyone's attitudes about blindness can be changed. Education of the sighted and the blind about blindness has always been one of the basic tenets of the National Federation of the Blind. Why not put the burden where it belongs? If public attitudes about the blind and other disabled cannot be morally coerced or administratively decreed, then they must be legislatively declared and judicially enforced. Until this is accomplished the blind along with other disabled and disadvantaged groups will not have achieved the first class citizenship to which they are entitled. WANTED: A Florida Affiliate of the National Federation of the Blind. A group of blind Floridians have started out to achieve this goal and will welcome all possible help. We are calling blind teachers, medical secretaries, stand operators, business and professional people and all other adult blind persons who are permanent residents of Florida to work with us on this project. Everyone who is interested in this effort should write to: FRIENDS of the NFB, 15775 N. E. 13th Ave., North Miami Beach, Florida 33162. The Division for the Blind and Physically Handicapped of the Library of Congress recently announced the appointment of two new staff members. Julia M. Losinski became the Assistant Chief for Reader Services. She was formerly with the Prince George's County Memorial Library in Hyattsville, Maryland. Lillias D. Burns is the new Head, Selection and Publications Section. Miss Burns formerly worked with the Tennessee Department of Corrections and the Department of Mental Health. Virginia Nagle was recently unanimously elected President of the Capitol Chapter of the NFB, serving Washington, D.C. Virginia is a dynamic and forthright gal who will move the Chapter forward vigorously. Oh, yes, Virginia's husband is named John. Dr. Mae Davidow suggests that all eye glasses for Pakistan be addressed and mailed to CARE, Inc., Pier 38 South 156-3 —For Pakistan, Philadelphia, Pennsylvania. The first park for blind persons in the Orient opened recently in Manila, Philippine Islands under the sponsorship of the wife of the President of the Philippines. The park takes up one acre within one hundred fifty acres of Manila's famous Ridal Park. The park has been paved with concrete stones—rough surfaces for open areas and smooth surfaces for narrow paths. Tiles, set in various ways in cement, indicate to the sightless visitor different sections of the park- the aviary, the flower beds, the seats. Much of the special park is under cover and a braille library is being added. The Kentucky Federation of the Blind passed a resolution asking twenty five thousand dollars in state funds for expansion of the vending stand program in that State which now employs some sixty or seventy blind Kentucky businessmen. The requested twenty five thousand dollars would bring in an additional one hundred thousand dollars in federal funds by virtue of the four-to-one matching plan. The first meeting of the 1969-1970 season of the Blind Professionals Society was recently held in Boston. Guest speaker was John F. Nagle, Chief of the Washington Office of the National Federation of the Blind. "Progress of Professional Blind People in Competitive Occupations" was his topic. Bing Crosby is serving as National Chairman for the 1969 Sight-Saving Campaign of the National Society for the Prevention of Blindness. It is expected that, with a voice and face as familiar to all Americans as Bing's, his radio and television messages will bring optimum public attention to the Society's efforts to prevent blindness. Daemon Steiger performs all types of magic and sleight of hand. He is a 1968 graduate of the Missouri School for the Blind and is being widely acclaimed for his performances of prestidigitation. The Colorado Springs Chapter (Colorado) of the NFB has doubled its membership since its representatives attended the National Convention in Columbia in July. Carl Coleman, the President of the Chapter, and his busy wife have actively supported and sponsored NFB chapters in Denver, Greeley, Pueblo, Boulder, Grand Junction, and now Colorado Springs. With such members as these, no wonder the Colorado Federation is spreading the gospel like a blanket all over the State. Three prisoners recently escaped from the new Idaho State Penitentiary in Boise. Listed as the most dangerous member of the trio was a convicted murderer who was blinded in prison. He had been receiving orientation training from the Idaho Commission for the Blind, including travel techniques using the long, fiberglass cane. When the Idaho Commission teaches one to travel, apparently he sometimes travels too far! The U. S. Civil Service Commission recently has issued a pamphlet entitled "Employment of the Blind in Federal Service". It describes the policy of the Federal Government in hiring the handicapped, training courses, special testing, and readers for the blind, as well as how to apply. Copies may be obtained from the U. S. Civil Service Commission, Washington, D. C. 20415. In June the Associated Blind of Greater Brockton (Massachusetts) elected the following officers, who will take office in the fall: President, Manuel Rubin; Vice President, Lillian Brown; Secretary, Alice Silba; Treasurer, Priscilla Shepard; Sergeant-at-arms, Martel Silba; Members-at-large, Geneva Rudd and Ann Prendergast; Trustees, Rose Rubbo, Leo St. James and Barbara Huston; Sighted secretary, Mrs. Mae Brooks. The Congress passed a bill which lets the states trim their medicaid programs after hearing pleas that the program had rocketed in cost and was causing some states financial distress. The bill provides that a state may reduce services if it is spending as much overall on the program this year as last; that it is maintaining controls on cost and utilization; and that it doesn't increase the unit cost of payments to hospitals, physicians, nursing homes and other providers of services. The legislation also would extend from 1975 to 1977 the time allowed states to meet the goal of comprehensive health care services for all who can't afford them. This past summer the Organizing Committee of the Associated Blind of Massachusetts held a meeting at Perkins School for the Blind to explore the possibility of organizing a student group in Massachusetts. Committee members spoke to the blind college students concerning aims, purposes and philosophy of the ABM and the NFB. The students then went into a huddle and made up a list of questions relative to various problems and situations encountered by blind students and what might be done about them. The matter of forming a student organization is being pursued. Twelve blind students attended a special summer class at Berkeley (California) High School which taught "living skills". The six-week session was designed to provide specialized training in four non-academic subjects—home economics, home mechanics, recreation and mobility. Lawrence Welch of Kalamazoo, Michigan died. He was the founder and first President of the Michigan Council of the Blind, which was formed in 1949. Larry served on the Board in various capacities until his death. His life was a struggle for jobs and an adequate living yet he never raised any objections to any work assignment in behalf of the organized blind movement. The Palmetto Auroran, publication of the South Carolina Aurora Club of the Blind, reports that the General Assembly of that State appropriated $81,000 for cash assistance to the States 1,900 Aid to the Blind recipients resulting in an average monthly increase of between $8 and $9 per recipient. Newly elected officers of the Associated Blind of Watertown (Massachusetts) include the following: President, Mary Castonguay; First Vice-President, Doris Nicholas; Second Vice-President, Mary Czub; Recording secretary, Frances Buckley; Corresponding secretary, Joseph Jablonski; Treasurer, Edward Connelly. Irene Campbell is newly elected as a lay member, and Dorothy Ingersoll, as a trustee. Guided by pop music, a relay team of four British blind swimmers swam the English Channel recently. Their twenty-three mile swim took more than fourteen and one-half hours. Two of the men are telephonists, the third a grocer, and the fourth a shorthand-typist. One of the men said, "Swimming is something blind people can do as well as anyone, and we proved it." The American Foundation for the Blind recently released its 1969-1970 Aids and Appliances Catalogue containing nearly three hundred items ranging from brailled watches to an audible Scout compass. One new item is an insulin syringe with an adjustable positive stop which makes possible self-injection of insulin without fear of incorrect dosage. The syringe must be ordered by a doctor who sets the positive stop at the exact dosage for his diabetic patient. Other items featured in the new catalogue are watches in twenty-six different styles, new brailled bingo boards, and a recently developed adjustable, heavy duty folding cane. Free catalogues may be ordered by writing the American Foundation, 15 West 16th Street, New York, New York 10011. Bill Oakley of the Richmond Area Federation of the Blind in Virginia presented to the State President, Dorothea Foulkrod a beautiful solid walnut gavel and block which he himself made for use in all meetings of the Virginia Federation of the Blind. The gavel has already been used at one annual convention and two Board meetings. A three-judge federal court has ruled that welfare payments may not be withheld solely because a recipient refuses to allow a social worker into her home without a warrant. The court held that a recipient could not be required to waive her Fourth Amendment protection against unreasonable search and seizure to maintain eligibility for public assistance. The court issued the injunction against the New York Department of Social Services. Mrs. Lois Forstner of Rahway, New Jersey was so impressed by the obvious traveling ability of the one thousand or more blind persons at the NFB Columbia Convention, that she felt compelled to write to the Monitor about it. She suggested that such a convention has great publicity value for the NFB and should even be publicized through the various news media for the edification of the general public and those insurance companies bent upon categorizing the blind as poor insurance risks. The following seem to be the trends of the Nixon Administration insofar as the Economic Opportunity programs are concerned: The Office of Economic Opportunity will spin off substantial operating programs to other agencies and will administer, in the main, programs of research, demonstration, etc. The Community Action Program (CAP) will also have its functions sharply reduced. For instance, legal services and health services will be transferred from CAP to the Office of the Administrator. A U. S. Navy Research Unit is working on a vaccine against trachoma, which currently affects at least four hundred million people in Asia, the Middle East, and other regions. Trachoma is the world's principal cause of blindness. A special three-judge Federal Court in New Haven, Connecticut invalidated a Connecticut requirement that the mother of an illegitimate child reveal the name of the child's father in order to get state welfare. The plaintiffs contended that Congress requires only that a child be needy and dependent to be eligible for welfare aid and that the State of Connecticut had created an additional eligibility requirement by conditioning the availability of AFDC assistance on the mother's willingness to divulge the name of the father. Although the case was brought on constitutional grounds, a majority on the Court declined to go into the constitutional question, deciding the case instead on statutory grounds. Both branches of the Massachusetts State Legislature approved a bill tightening medicaid requirements and cracking down on fraudulent practices by those who serve medicaid recipients. The measure provides that recipients must get prior approval before medical or dental care, must register for an identification card, and must have their eligibility reviewed every six months. Criticizing the 1969 New York State Legislature forgiving the aged, blind and disabled welfare recipients in seven counties in the area of New York City four to five dollars a month less than such persons receive in the city, a three-judge Federal Court granted a temporary injunction against further enforcement of the law. The plaintiffs contended their constitutional rights to equal treatment had been violated by the state law, and the court agreed. The Blue Ridge Federation of the Blind, the newest affiliated chapter of the Virginia Federation of the Blind was organized in Charlottesville, Virginia, September 27, 1969. With Monticello, the home of Thomas Jefferson, and the University of Virginia which Thomas Jefferson founded, just a few blocks distant as a symbolic reminder of the Declaration of Independence—that it was for blind Americans as well as sighted Americans—sixteen blind men and women from the Charlottesville area of the Dominion State gathered in the home of Billie and Dot Sullivan to determine whether to join the organized blind movement—and fifteen so determined! Dorothea Foulkrod, President of the VFB and her husband, Everett, Robert McDonald. VFB Vice President, and John Nagle of the NFB Washington Office and his wife, Virginia, were also present to explain the whys and wherefores of the Federation and to assist as needed. After talks, questions and answers, a Constitution was considered and adopted. Then, elections were held, and the following were elected to a one-year term of office: Inez Wine, President; Billie Sullivan, First Vice-President; Lloyd Warren, Second Vice-President; Carolyn Wilson, Secretary-Treasurer; and Billie J. Wine and Milton Montgomery as Executive Board members.